Christmas Day is a public holiday in Ethiopia and Eritrea that is celebrated on January 7 or on 27 Tahsas of the Ethiopian calendar. Christmas is called Ledet (ልደት) in Eritrea or Gena (ገና) in Ethiopia. Many people who are Christian in the two countries fast for 40 days (it is called fast of the prophets). They then head to church at dawn on Christmas morning. On Christmas Day, there will be colorful musical celebrations which involve the priests dressed in their best robes performing rituals, including dancing and playing drums and other instruments. Early in the morning at dawn, everyone dresses in white and head to the nearby church. Late in the afternoon there will be the traditional game of Gena, a kind of hockey. According to an Ethiopian legend, the game was being played by the shepherds who were tending their flocks on the night that Jesus was born. The game is attended by the leader of the community. A prize is awarded to the winner of the Gena game. Most Ethiopians don a traditional Shamma, a thin, white cotton wrap with brightly colored stripes across the ends.The holiday is followed up by the three-day festival Timkat starting on January 19 and celebrating the baptism of Jesus Christ. Christmas Day is a public holiday in Nigeria which is always marked by the emptying of towns and cities as Nigerians that have been successful returning to their ancestral villages to be with family and to bless those less fortunate. As the towns and cities empty, people jam the West African markets to buy and transport live chickens, goats and cows that will be needed for the Christmas meals. On Christmas Eve, traditional meals are prepared according to the traditions of each region. Rather than having candy and cakes, Nigerians as a whole tend to prepare various meats in large quantities. In the south, a dish called Jollof rice is served with stews of various meats along with boiled beans and fried plantains; in the north, Rice and Stew as well as Tuwon Shinkafa, a rice pudding served with various meat stews, is preferred. In the North several local desserts are also made which is hardly ever found in other parts of Nigeria. An alternative in both regions (but more favored in the south) is a pepper soup with fish, goat, or beef which may also be served with Fufu (pounded yam). Served with this food are an array of mainly alcoholic drinks such as the traditional palm wine or various local and imported beers and wines; children and women may be served locally-made soft-drink equivalents instead. Gift giving in Nigeria often involves money and the flow of gifts from the more fortunate to the less fortunate. After the "successful" visitors have come from their towns, cities, and even overseas, they are given time to settle in. Afterwards, local relatives begin approaching them asking for assistance of some kind, whether financial or not. Financial donations and elaborately wrapped gifts may be given out at lavish parties, weddings, and ceremonies; sometimes the money is scattered in the air to be grabbed by the others or stuck onto the sweaty foreheads of those dancing. Religion in Nigeria is about equally divided between Christians and Muslims. There are occasional outbreaks of religious conflict. The Islamic sect Boko Haram has attacked Christian churches with bombings on Christmas 2011. Christmas in South Africa is a public holiday celebrated on December 25. Many European traditions are maintained despite the distance from Europe. Christmas trees are set up in homes and the children are given presents in their stockings. Traditional 'fir' Christmas trees are popular and children leave a stocking out for Santa Claus on Christmas Eve. The gift bearer is Santa Claus on Christmas Eve. The Christmas meal is mince pies, turkey, roast beef or a barbecue outdoors. The meal is finished with Christmas Pudding. Christmas crackers are used to make noise. Despite Christmas occurring at the height of the Southern Hemisphere summer, wintery motifs common to the Northern Hemisphere are popular. In China, December 25 is not a legal holiday. However, it is still designated as a public holiday in China's special administrative regions of Hong Kong and Macau, both former colonies of Western powers with (nominal) Christian cultural heritage. In the mainland, the small percentage of Chinese citizens who consider themselves Christians unofficially, and usually privately, observe Christmas. Many other individuals celebrate Christmas-like festivities even though they do not consider themselves Christians. Many customs, including sending cards, exchanging gifts, and hanging stockings are very similar to Western celebrations. Commercial Christmas decorations, signs, and other symbolic items have become increasingly prevalent during the month of December in large urban centres of mainland China, reflecting a cultural interest in this Western phenomenon, and, sometimes, retail marketing campaigns as well. In Hong Kong, where Christmas is a public holiday, many buildings facing Victoria Harbour will be decked out in Christmas lights. Christmas trees are found in major malls and other public buildings, as well as in many homes, despite the small living area. Catholics in Hong Kong can attend Christmas Mass. The Christian population of Hong Kong attend Church Services on Christmas Day. There are various Christmas markets that are held throughout Hong Kong from November until Mid-December which sells Christmas decorations, food and other goods to celebrate the holidays. There are also nativity scenes which are placed in the home, and on Christmas Eve and Christmas Day, people enjoy singing Christmas carols and play Christmas music with their instruments to an audience. In schools, students participate in Christmas concerts and perform a Christmas show depicting the story of Christmas. On Christmas Eve and Christmas Day, families around Hong Kong join together for Christmas lunch and dinner either at home or in a hotel. Families gather together to decorate the Christmas Trees together as a yearly tradition. Encouraged by commerce, the secular celebration of Christmas is popular in Japan, though Christmas is not a national holiday. Gifts are sometimes exchanged. Christmas parties are held around Christmas Day; Japanese Christmas cake, a white sponge cake covered with cream and decorated with strawberries, is often consumed and Stollen cake, either imported or made locally, is widely available. Christmas lights decorate cities, and Christmas trees adorn living areas and malls. Christmas Eve has become a holiday for couples to spend time together and exchange gifts. A successful advertising campaign in the 1970s made eating at KFC around Christmas a national custom. Its chicken meals are so popular during the season that stores take reservations months in advance. The first recorded Christmas in Japan was a Mass held by Jesuit Missionaries in Yamaguchi Prefecture in 1552. Some believe that unrecorded celebrations were held before this date, starting in 1549 when Saint Francis Xavier arrived in Japan. Christianity was banned throughout Japan in 1612. However, a small enclave of Kakure Kirishitan ("hidden Christians") continued to practice underground over the next 250 years. Christianity in Japan along with Christmas reemerged in the Meiji period. Influenced by America, Christmas parties were held and presents were exchanged. The practice slowly spread, but its proximity to the New Year's celebrations makes it a smaller focus of attention. During World War II, all celebrations, especially American, were suppressed. From the 1960s, with an expanding economy, and influenced by American TV, Christmas became popular. Many songs and TV series present Christmas as romantic, for example "Last Christmas" by Exile. The birthday of the current emperor, Akihito, on December 23 is a national holiday. Businesses soon close for the New Year's holidays, reopening after January 3. As Christmas is totally banned in North Korea, South Koreans living near the DMZ are not allowed to put an outdoor Christmas tree or decorations. Being a British colony until 1947, many British traditions stayed on in India. Christmas is a state holiday in India, although Christianity in India is a minority with only 2.3% (of 1.237 Billion) of the population. Most of the Christians in India attend the church. Many Christian houses in India decorate Christmas cribs and distribute sweets and cakes to their neighbors. In many of the schools that are run by the Christian missionaries, the children actively participate in Christmas programs. Also in many non-religious schools, there is tradition of Christmas celebration. 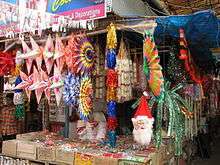 Christmas is also increasingly celebrated by other religions in India. Christmas is known as "Badaa Din" (Big Day) in North and North-West India and people plant trees on this day. Christianity in Pakistan constitutes the second largest religious minority community in Pakistan after Hindus. The total number of Christians is approximately 2,800,000 in 2008, or 1.6% of the population. Of these, approximately half are Roman Catholic and half Protestant. Christians celebrate Christmas by going from house to house singing carols, and in return the family offers something to the choir. Mostly the money collected from such carols is used for charity works or is given to the church. Their homes are decorated with local Christmas handicrafts while artificial stars signifying the Star of Bethlehem are hung on rooftops. 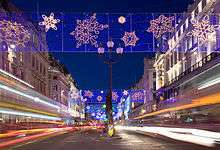 Christmas celebrations are also popular with the urban middle class in the country with hotels, cafes, restaurants and theme parks hosting festivities and special events. As of December 22, 2015, Christmas is totally banned in Brunei (but for its expatriate and local Christian community, it is still celebrated as usual privately amongst themselves), which includes putting up Christmas trees, singing Christmas carols, Nativity plays, festive greeting, and even dressing as Santa Claus. About 20 percent of the population are non-Muslims and anyone caught will be face up to five years in jail. Before the Sharia law has passed in 2014, non-Muslim expats, were free to celebrate Christmas in Brunei. The Christmas in Indonesia (locally known as Natal, from the Portuguese word for Christmas), is one of many public holidays in Indonesia which approximately 16.5 million Christians and 6.9 million Roman Catholics, celebrated with various traditions throughout the country. In the regions with majority of Christian / Catholics, the Christmas season is filled with ceremonies, festival, and local foods. In big cities, many shopping centres, offices, some roads, and other commercial places are mostly decorated with Christmas stuff such as plastic Christmas trees and Sinterklas (derived from the Dutch word Sinterklaas) and its reindeers. Most local television channels will broadcast Christmas musical concerts and annual national Christmas celebrations like concerts and Christmas shows which are held by the government. Like other countries, on Christmas Eve, people will go to church for Misa and will go to church again the next morning, and exchanging gifts is a usual tradition for Christians in Indonesia. In addition to traditional foods, generally every Christmas Day is filled with cookies, like nastar (pineapple tart), kastengel (from Dutch word kasteengel), or 'putri salju'. Although Christmas is a public holiday in Malaysia, much of the public celebration is commercial in nature and has no overt religious overtones. Occasionally, Christian activist groups do buy newspaper advertorials on Christmas or Easter but this is largely only allowed in English newspapers and permission is not given every year. The advertorials themselves are usually indirect statements. There has been controversy over whether or not the national government has exerted pressure on Malaysian Christians not to use Christian religious symbols and hymns that specifically mention Jesus Christ. Christmas in the Philippines, one of two predominantly Catholic countries in Asia (the other one being East Timor), is one of the biggest holidays on the calendar and is widely celebrated. The country has earned the distinction of celebrating the world's longest Christmas season, with Christmas carols heard as early as September 1. The season is traditionally ushered in by the nine-day dawn Masses that start on December 16. Known as the Misas de Aguinaldo (Gift Masses) or Misa de Gallo (Rooster's Mass) in the traditional Spanish, these Masses are more popularly known in Tagalog as the Simbang Gabi, and are held in Catholic parishes and chapels nationwide. Usually, aside from the already legal holidays which are Rizal Day (December 30) and New Year's Eve (December 31), other days in close proximity such as Christmas Eve (December 24), Niños Inocentes (December 28), and the Epiphany (traditionally, January 6 but now on the first Sunday of January) are also declared non-working days. As in many East Asian countries, secular Christmas displays are common both in business establishments and in public, including lights, Christmas trees, depictions of Santa Claus despite the tropical climate, and Christmas greetings in various foreign languages and various Philippine languages. Occasionally such displays are left in place even in summer for example the parol representing the "Star of Bethlehem" which led the Three Kings to the newborn Baby Jesus. For Filipinos, Christmas Eve (Tagalog: Bisperas ng Pasko; Spanish: Víspera del Día de Navidad) on December 24 is celebrated with the Midnight Mass, and immediately after, the much-anticipated Noche Buena – the traditional Christmas Eve feast. Family members dine together around 12 midnight on traditional Nochebuena fare, which may include: queso de bola (English: "ball of cheese"; this is actually edam cheese), tsokolate (a hot chocolate drink), and jamón (Christmas ham), lechón, roast chicken or turkey, pasta, relleno (stuffed bangus or chicken), pan de sal, and various desserts including cakes and the ubiquitous fruit salad. Some would also open presents at this time. On December 31, New Year's Eve (Tagalog: Bisperas ng Bagong Taon; Spanish: Víspera del Año Nuevo), Filipino families gather for the Media Noche or midnight meal – a feast that is also supposed to symbolize their hopes for a prosperous New Year. In spite of the campaign against firecrackers, many Filipinos still see these as the traditional means to greet the New Year. The loud noises and sounds of merrymaking are also supposed to drive away bad spirits. Safer methods of merrymaking include banging on pots and pans and blowing on car horns. Folk beliefs also include encouraging children to jump at the stroke of midnight in the belief that they will grow up tall, displaying circular fruit and wearing clothes with dots and other circular designs to symbolize money, eating twelve grapes at 12 midnight for good luck in the twelve months of the year, and opening windows and doors during the first day of the New Year to let in good luck. Christmas officially ends on the Feast of the Three Kings (Tres Reyes in Spanish or Tatlong Hari in Tagalog), also known as the Feast of the Epiphany (Spanish: Fiesta de Epifanía). The Feast of the Three Kings was traditionally commemorated on January 6 but is now celebrated on the first Sunday after the New Year. Some children leave their shoes out, in the belief that the Three Kings will leave gifts like candy or money inside. But the celebrations do not end there, since 2011, as mandated by the Catholic Church, they are on the second Sunday of January in honor of the Lord Jesus's baptism in the Jordan (the Solemnity of the Lord's Baptism or in Spanish Solemnidad de Bautismo del Señor). 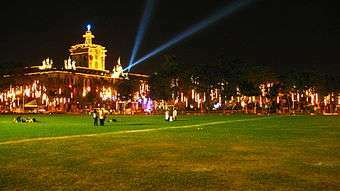 The final salvo of these celebrations is marked by the feast of the Black Nazarene every January 9 in Manila and Cagayan de Oro, but can also, due to the celebrations in honor of the Santo Niño in the third and fourth Sundays of January in some places, can even extend till the final weeks of that month. Christmas is a public holiday in Singapore that is widely celebrated. The Christmas season is also a popular period for shopping centres and businesses to conduct year-end sales, and will offer discounts and promotions that tie in with the festivities. The famous Singaporean shopping belt Orchard Road, as well as the Marina Bay area will feature lights and other decorations from early November till early January (the 2014 part is November 14, 2014 all the way until January 5, 2015). The Christmas light-up and decorated shopping malls along Orchard Road often attract numerous visitors, locals and tourists alike. Other than the light-up, other activities such as caroling, concerts and parades can also be experienced in Orchard Road. In addition, companies in Singapore usually arrange gift exchange programs on the last working day before Christmas. Christmas is not a national holiday but is becoming increasingly popular in Vietnam. The ever-wealthier Vietnamese are embracing Christmas precisely because of its non-religious glamor and commercial appeal. Locals also are more exposed to Western culture, though their style of celebrating Christmas might seem unrecognizable to some Westerners. Vietnamese may be more accepting of corporate influence because for many, Christmas was never based on personal values to begin with. It’s not a time to have dinner at home with family and show thanks for one another. Instead, it’s a time to go out on the town, shop, and take pictures with friends in front of colorful displays, especially on December 24. The Assyrians, the indigenous people of northwestern Iran, northern Iraq, northeastern Syria, and southeastern Turkey that belong to the Assyrian Church of the East, Ancient Church of the East, Syriac Orthodox Church, and Chaldean Catholic Church today celebrate Christmas on December 25. Assyrians call Christmas Eeda Zura, meaning "little feast." Traditionally, Assyrians fast (sohma) from December 1 until Christmas Day. In Iraq, for instance, on Christmas Eve, Assyrian families congregate outside of their house and hold lighted candles while a child reads aloud the nativity story. Then they all sing psalms over a bonfire made of thorn bushes. Folklore says that if the thorns burn to ashes, the family will have good luck. After the fire has been reduced to ashes, the family members will jump three times over the ashes and make a wish. The next day, on Christmas, "as another bonfire burns in the churchyard, the bishops lead the service while carrying a figure of the baby Jesus. He blesses one person with a touch. That person touches the next person and the touch passes around until all have felt the touch of peace." Many Assyrians will attend the Shaharta, or midnight vigil before Christmas. On Christmas Day, when families gather together after the Shaharta or morning mass, raza d'mowlada d'maran, the fast is broken by eating traditional Assyrian foods such as pacha/reesh-aqle (meaning "from the head to the tail"), which is a boiled soup made of sheep or cow intestines, tongue, stomach, legs, and spices or harissa, a porridge made of ground wheat and chicken (both dishes are prepared usually overnight). These two dishes are only made twice a year: on Christmas and Easter. Traditional desserts eaten after the main course include Killeche, a date and walnut-stuffed cookie, and Kadeh, another stuffed pastry. After the feast is finished, Assyrians will visit the houses of family and friends to exchange Christmas greetings, saying, "Eedokhon breekha," meaning "May your feast be blessed." There, the host will serve tea, Turkish coffee, and Killeche and Kadeh to guests. Although Christmas is celebrated in a much more religious fashion, in recent years, families put up a small Christmas tree in the house. Christmas is an official holiday in Lebanon. All Lebanese celebrate Christmas on December 24 and 25 except for the Armenian Lebanese who celebrate it on the Epiphany on January 6 which is also an official holiday in Lebanon. Lebanese families come together and butcher a sheep for a Christmas Eve feast, in honor of the birth of The Shepherd Jesus Christ. On that night the head of the house passes around a piece of coal representing the sins before Christ. After the piece of coal has been passed around it is then set on fire. After Dinner, Christian Lebanese attend midnight mass. Santa Claus is known by the French, Papa Noël. Gifts are either dropped off at church or Papa Noël makes a personal appearance at the home. Christmas is observed widely on December 25. Governments recognizing the holiday include those of: the United States, where it is a federal holiday for federal employees and a legal holiday in the respective States; Canada, where it is a nationwide statutory holiday; Mexico, where it is also a nationwide statutory holiday; and several others. In the Canadian provinces where English is the predominant language, Christmas traditions are largely similar to those of the United States, with some lingering influences from the United Kingdom and newer traditions brought by immigrants from other European countries. Mince pies, plum pudding, and Christmas cake are traditionally served as Christmas dinner desserts, following the traditional meal of roast turkey, stuffing, potatoes, and winter vegetables. Christmas table crackers are not uncommon and, in some parts of Newfoundland and Nova Scotia, Christmas traditions include mummers. North American influences on Christmas are evident in the hanging of stockings on Christmas Eve, to be filled by Santa Claus. However, Canadian children believe that the home of Santa Claus is located at the North Pole, in Canada, and, through Canada Post, address thousands of letters to Santa Claus each year, using the postal code designation H0H 0H0. Decorated Christmas trees, either fresh cut or artificial, were introduced to Canada in 1781, originally by German soldiers stationed in Quebec during the American Revolution, and are now common in private homes and commercial spaces throughout most of Canada. As Canada is a cold, dark country in winter, lights are often put up in public places and on commercial and residential buildings in November and December. Many communities have celebrations that include light events, such as the Cavalcade of Lights Festival in Toronto, the Montreal Christmas Fireworks, or the Bright Nights in Stanley Park, Vancouver. 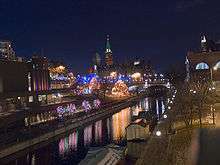 A national program, Christmas Lights Across Canada, illuminates Ottawa, the national capital, and the 13 provincial and territorial capitals. In the province of Quebec, Christmas traditions include réveillon, Père Noël ("Father Christmas"), and the bûche de Noël (Yule log), among many others. A traditional dish for the réveillon is tourtière, a savoury meat pie, and gifts are opened during réveillon, often following Midnight Mass. The Royal Christmas Message from the Canadian monarch is televised nationwide in Canada, the occasion being an observance which unites Canadians with citizens of the other Commonwealth countries worldwide. The observation of Boxing Day on the day following Christmas Day is a tradition practiced in Canada, as it is in many other Anglophone countries, although not in the United States. In Canada, Boxing Day is a day (or the beginning of a few days) of deeply discounted sale prices at retail stores which attract large numbers of shoppers in search of bargains. Christmas is a statutory holiday in Mexico and workers can have the day off with pay. Mexico's Christmas is filled with over 30 traditions found only within Mexican Christmas. Over nine days, groups of townspeople go from door to door in a fashion of when the parents of the unborn baby Jesus Christ looked for shelter to pass the night when they arrived at Bethlehem, and are periodically called inside homes to participate in the breaking of a candy-filled piñata. Mexican Christmas festivities start on December 12, with the feast of La Guadalupana (Virgin of Guadalupe), and end on January 6, with the Epiphany. Since the 1990s, Mexican society has embraced a new concept linking several celebrations around Christmas season into what is known as the Guadalupe-Reyes Marathon. At midnight on Christmas, many families place the figure of baby Jesus in their nacimientos (Nativity scenes), as the symbolic representation of Christmas as a whole. In the center and south of Mexico, children receive gifts on Christmas Eve and on January 6, they celebrate the Feast of the Epiphany, when, according to tradition, the Three Wise Men (3 Wizard Kings) brought gifts to Bethlehem for Jesus Christ. Santa Claus (or Santo Clos, as he's known in Mexico) is who brings the children their gifts, but traditionally the Three Wise Men will fill the children's shoes with candies, oranges, tangerines, nuts, and sugar cane, and sometimes money or gold. For the Three Wise Men gave Baby Jesus Gold for his future. Christmas is a widely celebrated festive holiday in the United States, and Christmas Day is officially recognized as a federal holiday by the US Government. The Christmas and holiday season begins around the end of November with a major shopping kickoff on Black Friday, the day after the U.S. holiday of Thanksgiving, though Christmas decorations and music playing in stores sometimes extend into the period between Halloween and Thanksgiving. Many schools and businesses are closed during the period between Christmas and the New Year's Day holiday, which is a time commonly used to spend time with family, return unwanted gifts at stores, and shop after-Christmas sales. Most decorations are taken down by New Years or Epiphany. Other observances considered part of the season (and potentially included in non-denominational holiday greetings like "Happy Holidays") include Hanukkah, Yule, Epiphany, Kwanzaa, and winter solstice celebrations. The interior and exterior of houses are decorated during the weeks leading up to Christmas Eve. Christmas tree farms in the United States and Canada provide families with trees for their homes, many opting for artificial ones, but some for real ones. The Christmas tree usually stands centrally in the home, decorated with ornaments, tinsel and lights, with an angel or a star symbolizing the Star of Bethlehem at the top. Christmas Eve is popularly described as "the night before Christmas" in the poem actually titled "A Visit from St. Nicholas". Better known as Santa Claus, he is said to visit homes while children are sleeping during the night before Christmas morning. The fireplaces in many homes have been replaced by electric fireplaces, but the yule log has remained a tradition. Christmas stockings are hung on the mantelpiece for Santa Claus to fill with little gifts ("stocking stuffers"). It is tradition throughout the United States for children to leave a glass of milk and plate of Christmas cookies for Santa Claus nearby. Presents the family will exchange are wrapped and placed near the tree, including presents to be given to pets. Friends exchange wrapped presents and tell each other, "Do not open before Christmas!" Grandparents, aunts and uncles, cousins, siblings and occasionally guests from out of town are entertained in the home or else visited. Wrapped presents are most commonly opened on the morning of Christmas Day; however, some families choose to open all or some of their presents on Christmas Eve, depending on evolving family traditions, logistics, and the age of the children involved; for example, adults might open their presents on Christmas Eve and minor children on Christmas morning, or everyone might open their gifts on Christmas morning. Others follow the tradition of opening family-exchanged gifts on Christmas Eve night, followed by opening of the presents Santa brought on Christmas morning. Children are normally allowed to play with their new toys and games afterwards. The traditional Christmas dinner usually features either roasted turkey with stuffing (sometimes called dressing), ham, or roast beef and Yorkshire puddings. Potatoes, squash, roasted vegetables and cranberry sauce are served along with tonics and sherries. A variety of sweet pastry and egg nog sprinkled with cinnamon and nutmeg are served in the United States. Certain dishes such as casseroles and desserts are prepared with a family recipe (usually kept a secret). Sometimes, families also partake in a religious tradition, such as the consumption of a Christmas wafer in Christian families of European ancestry. Fruits, nuts, cheeses and chocolates are enjoyed as snacks. 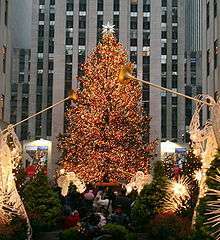 Christmas-related tourist attractions, such as the Rockefeller Center Christmas tree and elaborate animated department store Christmas windows in New York City are heavily visited by tourists from all over the world. Christmas music can be heard in the background. The Mormon Tabernacle Choir is one whose annual carol singing is well-recognized; another example is the Boys choir heard singing Christmas Time Is Here, a song featured in the animated television special "A Charlie Brown Christmas". Christmas symphony orchestra and choral presentation such as Handel's Messiah and performances of The Nutcracker ballet are attended. Local radio stations may temporarily switch format to play exclusively Christmas music, some going to an all-Christmas format as early as mid-October. A few television stations broadcast a Yule Log without interruption for several hours. News broadcasts and talk shows feature Christmas-themed segments, emphasizing fellowship and goodwill among neighbors. Of particular note is the observance of Christmas for military families of soldiers and sailors serving abroad, on both sides of the Canada–U.S. border. The Los Angeles Lakers have made it a tradition, since they relocated from Minneapolis prior to the 1960-61 NBA season, to have a home game on Christmas. As of 2015, the NBA now schedules five games on Christmas, usually including classic rivalry games as well as a rematch of the previous season's NBA Finals. Christmas for El Salvador still carries a strong meaning that brings families together. Despite the business on the streets and the red, green and white colors flooding the environment, Salvadoran people try honor the true meaning of Christmas the birth of Jesús. In El Salvador children celebrate Christmas by playing with firecrackers, fountains, such as the small volcancitos ("little volcanos") and sparklers, estrellitas ("little stars"). Teenagers and young adults display bigger fireworks or Roman Candles. Families also have parties in which they dance and eat. Santa Claus is known for appearing in TV and print ads, but people ask children if they already wrote a letter to little baby Jesus. Traditional Salvadoran Christmas dishes are sauteed turkey sandwiches in a baguette with lettuce and radishes, Salvadoran Tamales, and sweet bread for dessert. Drinks include hot chocolate, pineapple juice, Salvadoran horchata, Cherry Salvadoran horchata, and coffee. 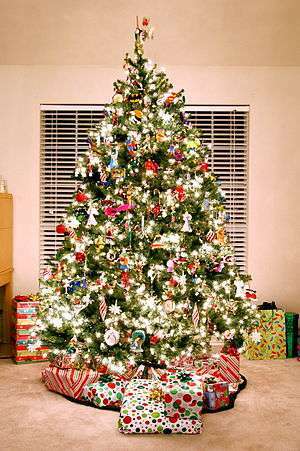 At 12:00 a.m. on December 25 everyone gathers around the Christmas tree and opens their presents. On Christmas in Guatemala, the people dress up in an ornamental hat named a Puritina and dance in a line. As with much of the country's culture, the celebration includes Spanish and Maya elements. Christmas Day on December 25 is a national holiday in Brazil. But because Brazil lies in the Southern Hemisphere, Brazilians celebrate Christmas in the summer. In the small cities in the entire country, as well as in the largest cities, like São Paulo, Rio de Janeiro, Recife, Salvador, Fortaleza, Curitiba, Porto Alegre, Brasília, Manaus, Belém, Natal and Belo Horizonte, the celebrations resemble in many ways the traditions in Europe and North America, with the Christmas tree, the exchanging of gifts and Christmas cards, the decoration of houses and buildings with electric lights and the nativity scene. Despite the warm tropical summer weather, some incongruences such as decorations with themes of winter and snow are not uncommon. 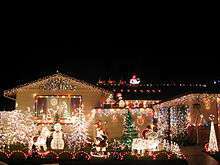 In some cities like Curitiba, there are decoration contests, when judges go to houses to look at the decorations, inside or outside of the house, and decide the most beautiful house. Christmas Eve is the most important day. Unlike in the North American and Anglo-Saxon tradition, Christmas takes action mainly near midnight, usually with big family dinners, opening of gifts and the celebration of the "Missa do Galo" (the rooster's mass) in churches throughout the nation. Many Brazilians decorate their homes with a Christmas Tree, there is no rule, the parents can decorate it by themselves as a surprise to the kids, or they can do it together. In addition to the Christmas tree, many families set up a Nativity scene as the main decoration. Nativity scenes are very popular in Brazil, and can be seen everywhere including churches and popular places around the town. Like many other countries, Christmas dinner in Brazil is normally served late in the evening on Christmas Eve around 10 or 11 p.m. The meal often includes farofa stuffing, assortments of fruit, fried cod, and roast turkey with a dessert called “rabanada”. Along with their meals, Brazilians typically drink champagne, wine, and fruit punch. Typically after they eat, many Brazilians attend a Midnight Mass service or watch the Pope’s television broadcast celebration of “Midnight Mass in Rome” with family and friends. Christmas is a public holiday in Colombia and is primarily a religious celebration. Presents are brought by El Niño Jesus / Niño Dios (Baby Jesus). While Christmas decorations may be put up as early as the beginning of November, the unofficial start of Colombian Christmas festivities takes place on December 7, Día de las Velitas, or "Day of the Candles." At night, the streets, sidewalks, balconies, porches, and driveways are decorated with candles and paper lanterns, which illuminate cities and towns in a yellow glow to honor the Immaculate Conception on the following day, December 8. In many cities, and even in small rural towns, neighborhoods get together and decorate their whole neighborhood or street, turning streets into virtual "tunnels of light." Many radio stations and local organizations hold contests for the best display of lights, making the competition for the best light show a serious event. The city of Medellín has become a popular tourist destination during the holiday season because of its Christmas lights. Activities such as musical events and firework displays are planned by cities and held during this time. Individually launched fireworks were a common item during the Christmas season in Colombia, often going on at any time of the day in many cities. However, a recent ban has decreased the individual use of fireworks, and now only cities or towns are able to hold firework displays. December 16 is the first day of the Christmas Novena, a devotion consisting of prayer said on nine successive days, the last one held on Christmas Eve. The Novena is promoted by the Catholic Church as a staple of Christmas, and is very similar to the posadas celebrated in Mexico. It is a call for an understanding of the religious meaning of Christmas, and a way to counter the commercialism of the Christmas season. Individual traditions concerning the Novena may vary, but most families set up a "pesebre" (manger scene), sing religious Christmas carols called villancicos accompanied by tambourines, bells, and other simple percussion instruments, and read verses from the Bible as well as an interpretation which may change from year to year. Novenas serve as beautiful religious gatherings as well as learning environments for young children since kids have a central and active role in the celebration of the Novenas (they read prayers, sing, and play instruments guided by their family). From December 16 to 24, games called "aguinaldos" are played after having made a "pinky promise" deciding the prize for the winner and the punishment for the loser. The games include "Hablar y no contestar" (Talk but don't answer), "Dé pero no reciben" (Give but don't receive), "Pajita en boca" (Straw in the mouth), "Tres pies" (Three feet), "Beso robado" (Stolen kisses), and "Si y al no" (Yes or no). Churches offer dawn and nightly masses during the nine days of the novena, culminating with the Misa de Gallo (Rooster's Mass) on Christmas Eve at midnight. Christmas Eve is the most important day of Christmas in Colombia. Families and friends get together to pray the last Novena and wait until midnight to open the presents, parties are held until sunrise on Christmas Day, kids stay up late playing with their new presents, and fireworks fill the skies. Families gather around meals, music, and singing. Because Christmas Eve is the most important day, little occurs on December 25. Families join Christmas Day mass although it is not nearly as festive as Christmas Eve. The "Dia de los Santos Inocentes", or the Day of the Innocents, falls in the Christmas season, on December 28. The day commemorates the innocent infants (called the innocent ones) who were said to have been killed by King Herod in fear of the power of the newborn baby, Jesus. January 6, the day of the Revelation of the Magi (Epiphany), is called "Reyes Magos" (from The Three Magi), used to be a day of gift giving, but is celebrated less now since gifts are given mostly around Christmas Eve today. Some families still give presents, and it is also the day when godparents give Christmas presents. In Venezuela, Christmas is celebrated as a religious occasion. As in Colombia, the presents are brought by “El Niño Jesus” (Baby Jesus) instead of “Papá Noél” (Santa Claus), that still has an important role during this season. The unofficial start of the Christmas festivities is after the celebrations of "Feria de la Chinita", second half of November. The origin of this festival is the cult to Virgin Mary of Chiquinquirá, when various religious activities, processions, and music in the typical "Gaita style" to honor "La Chinita" (nickname of this Virgin). This event takes place in the Zulia Region, specifically in Maracaibo (the regional capital). After this, other cities join in the festivities and many activities take place including musical events and firework displays. In many cities, small rural towns and neighborhoods get together for the "patinatas" night festivals where children go and play with skateboards, roller blades and bicycles. These events are usually sponsored by the local church, where neighbors organize themselves and sell typical Christmas food, hot chocolate, hallaca, cookies, etc. Also still in some neighborhoods there is the "Parranda" where people go from one house to house with music and Christmas songs. The singers stops at neighbors' houses to get some food and drinks. Also in the Venezuelan Andes there is the same tradition of this kind of event but they carry an image of "baby Jesus" and this is called "Paradura del Niño." Children write request letters to Baby Jesus. The presents are sent by Baby Jesus at midnight, and most people have a party, which goes on until sunrise. Junkanoo festivals are held from Christmas Day morning until sunrise on December 27 after Boxing Day and held again on New Year's Day. It is a carnival featuring parading bands in colorful costumes, singing, dancing, and decorations. Bahamian Christmas foods include black cake, imported apples, pepper pot, pickled onions and ham. Drinks like ginger-beer, sorrel, mauby, and sweet potato fly are served on Christmas. Cuba had a long tradition of celebrating Christmas. Families used to gather at the dining table, and used to go to mass after dinner. The Communist Regime led by Dictator Fidel Castro abolished the paid Christmas holiday in 1969, citing that workers were needed to continue the sugar harvest. In 1998, the Regime declared December 25 a leisure day, as requested by Pope John Paul II as a condition to visit the country. It is a one-day public holiday and it is celebrated only in the evening. Radio stations play Christmas carols as early as October, reggae style and some international. Jamaicans paint their houses and hang new curtains for Christmas. Pepper lights, the local name for Christmas lights, go up even on trees. Junkanoo or John Canoe is a traditional Christmas celebration in Jamaica, influenced by African ancestors. This includes street dancing and a great parade through the streets with Jamaicans dressed in colorful masquerade costumes in which masks are worn. The traditional Jamaican Christmas meal includes ackee, saltfish, breadfruit, fried plantains, boiled bananas, freshly squeezed fruit juice and tea for breakfast; chicken, curried goat, stewed oxtail, rice and gungo peas for dinner. For dessert, sorrel drink and a Jamaican rum fruitcake along with red wine are served in many homes. Many people attend church for Christmas Eve or Christmas morning worship service. Some British Christmas traditions have stayed in Jamaica, like Father Christmas, roast beef or lamb dinners, Boxing Day, etc. In countries of Central Europe (for this purpose, roughly defined as the German-speaking countries Germany, Austria and Switzerland, the Czech Republic, Poland, Slovakia, Hungary and possibly other places) the main celebration date for the general public is Christmas Eve (December 24). The day is usually a fasting day; in some places children are told they'll see a golden pig if they hold fast until after dinner. When the evening comes preparation of Christmas Dinner starts. Traditions concerning dinner vary from region to region, for example, in Poland, Czech Republic, and Slovakia, the prevailing meal is fried carp with potato salad and fish (or cabbage) soup. However, in some places the tradition is porridge with mushrooms (a modest dish), and elsewhere the dinner is exceptionally rich, with up to 12 dishes. This in fact reveals that when Christmas comes around all the kids get presents from neighbours and house guest. Even the house pet got a little something to gnaw on. After the dinner comes the time for gifts. Children usually find their gifts under the Christmas Tree, with name stickers. An interesting example of complicated history of the region is the "fight" between Christmas beings. During communism, when countries of Central Europe were under Soviet influence, communist authorities strongly pushed Russian traditional Ded Moroz ("Grandfather Frost") in the place of Little Jesus won. Now Santa Claus is attacking, by means of advertising and Hollywood film production. Many people, Christians as well as people with just a Christian background, go to Roman Catholic midnight mass celebration. Other common attributes of Christmas in Central Europe include Christmas trees, mistletoe, Christmas garlands, and Bethlehem cribs. In many areas of Central Europe, St. Nicholas (Hungarian: Mikulás, Czech: Mikuláš, Polish: Mikołaj, Slovak: Mikuláš), or Santa Claus, does not come for Christmas. He visits families earlier, on the dawn of St. Nicholas Day on December 6, and for the well-behaved children he has presents and candy-bags to put into their well polished shoes that were set in the windows the previous evening. Although he neither parks his sleigh on rooftops nor climbs chimneys, his visits are usually accompanied by a diabolic-looking servant named Krampusz (in Austria, Slovenia, and Croatia: Krampus, in Czech and Slovak regions he is simply "čert", i.e. devil, without any name) who gives golden coloured birches for so called badly behaved children. Actually all children get both gifts and golden birches (Hungarian: virgács) in their shoes, no matter how they behaved themselves. In some German-speaking communities, in the German-speaking Europe; particularly in Catholic regions of western and southern Germany, Switzerland, Austria, South Tyrol and Liechtenstein, as well as in other Catholic regions of Central Europe, the Christkind (literally "Christ child") brings the presents on the evening of December 24 (Holy Evening or Heiliger Abend). :68–79 The Christkind is invisible; thus he is never seen by anyone. However, he rings a bell just before he leaves in order to let children know that the Christmas tree and the presents are ready. It is a tradition to lavishly decorate a Christmas tree in the days directly before Christmas or on the morning of Christmas Eve. On late Christmas Eve, after the bell rings, the tree is shown to the children and presents are exchanged. In Protestant churches, there is a service in the late afternoon intended to immediately precede the Christmas Eve meal and the exchanging of gifts. This service, called Christvesper, consists most often of scriptural readings, the Christmas Gospel from Luke 2, a Krippenspiel (nativity play), favourite Christmas carols and festive music for organ and choirs. In some regions the tradition of Quempas singing is still popular. Some Lutheran churches also celebrate a candlelight service at midnight besides the Christmas Vespers in the afternoon or early evening. Many Catholic churches also have a first Mass of Christmas, called Christmette, on "Heiliger Abend" about 4 p.m. for the children and parents to attend before the families return home for their meal. The crib is a very important part of the celebrations in Catholic areas especially Bavaria. In the largely Catholic Austria, Christmas markets are a long-standing tradition. In Vienna, for instance, the market is held in the large square in front of City Hall. Innsbruck opens its romantic Christmas market in the narrow medieval square at the foot of the Golden Roof. In Salzburg, the Christmas market takes over the square in front of the Cathedral with its picturesque stalls, while the tree vendors occupy Residenzplatz on the side of the huge Cathedral. However almost every small town has its own Christmas market. In Austria, Christmas trees play a very important part of Christmas celebrations. Every town sets up its own huge tree on the main square all decorated with candles, ornaments and candies and frequently there will be an extra one, adorned with bread crumbs, for the birds. In families the tree is decorated with gold and silver ornaments or stars made out of straw, sweets and candy wrapped in tinfoil, gilded nuts, etc. The feast of St Nicholas marks the beginning of Christmas in Austria. On Christmas Eve (December 24) the tree is lit for the first time and the whole family gathers to sing Christmas carols like “Silent Night, Holy Night”. 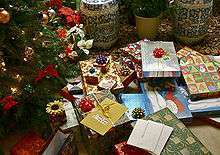 Gifts that are placed under the tree are opened after dinner on Christmas Eve. Austrian Christmas tradition has it that it is the Christ Child himself who decorates the Christmas tree on Christmas Eve and brings the children their Christmas presents, and it is to him that their letters and wish lists are addressed in the weeks before Christmas. The Christmas Eve dinner is the main event of the night often served with fried carp. The famous sachertorte and different kinds of chocolates are served as dessert. The Austrians also have special crescent shaped cookies served during Christmas time. In Germany Christmas traditions vary by region. Till the reformation Saint Nicholas' Day, December 6, Saint Nicholas was the main provider of Christmas presents. Nikolaus still puts goodies in children's shoes on that day. Sometimes St. Nicholas visits children in kindergarten, schools or at public events. They have to recite a short poem or sing a song in order to get sweets or a small gift. "Knecht Ruprecht" (the servant Ruprecht) – dressed in dark clothes with devil-like traits (usually noted as a long, bright red tongue and with a stick or a small whip in the hand) – sometimes accompanies St. Nicholas. His duty is to punish those children who haven't behaved during the year. Usually he doesn't have much to do. He merely stands near St. Nicholas as a warning to be good and polite. Nikolaus as well for some Glühwein for adults, there are some traditions connected with local firefighters, riders associations and church congregations. The Sorbs, a minority in Saxony and parts of Brandenbuerg with a language similar to Polish, have some specific traditions. E.g. in Jänschwalde, the Bescherkind Janšojski bog ("presents kid") is visiting the neighbors, a girl dressed in local costume and veil and goes around with two companions at the Wednesday before Christmas. It provides smaller presents like sweets, similar to the Nikolaus and provides blessings, stays however silent. Another tradition in Saxony is related to the Wooden toymaking in the Ore Mountains, especially Seiffen provides Christmas related decorations like Christmas pyramid and toys around the year. Christmas letters may be addressed e.g. to Engelskirchen (Angel's church) or Himmelpforten (Heaven's gate) or some other in municipalities with matching names. After privatization, Deutsche Post kept the tradition of dedicated Christmas offices, one in each state, answering letters and requests from children. Currently the actual Christmas gift-giving (German: "Bescherung") usually takes place on Christmas Eve. This tradition was introduced by Reformator, Martin Luther, as he as of the opinion that one should put the emphasis on Christ's birth and not on a saint's day and do away with the connotation that gifts have to be earned by good behavior. The gifts should be seen as a symbol for the gift of God's grace in Christ. This tradition quickly became common in predominantly Catholic regions as well. Gifts may be brought by the Weihnachtsmann (translation, "Christmas man"), who resembles either St. Nicholas or the American Santa Claus, or by Christkindl, a sprite-like child who may or may not represent the baby Jesus. :68–79 Till 1930, there was sort of south north divide between the realms of southern and silesian Christkind and Nordic Weihnachtsmann. After the gifts are opened the children often stay up as late as they like, often till the early hours of the morning. The Christmas Tree is first put up and decorated on the morning of the 24th. The gifts are then placed under the tree. Christmas services in the church serve as well to exchange greetings with neighbors and friends. After an evening meal one of the parents usually goes into the room where the tree is standing, lights the candles and rings a little bell. Then the children are allowed to go into the candlelit room. In many families it is still a custom to sing Christmas songs around the tree before opening up the presents. Some families attend a midnight church service "Christmette" after the evening meal and gift-giving. The culinary feast either takes place at supper on Christmas Eve or on the first day of Christmas. Traditions vary from region to region; carp is eaten in many parts of the country. Potato salad with frankfurter or wiener-sausages is popular in some families. Another simple meal which some families favor, especially in regions where Christmas Eve still has the character of a fast day, is vegetable or pea soup. In some regions, especially in Schleswig-Holstein where Danish influence is noticeable, a roasted duck or goose filled with plums, apples and raisins is family tradition. In other regions, especially in Mecklenburg and Pomerania, many families prefer kale with boiled potatoes, special sausages and ham. Many families have developed new traditions for themselves and eat such meals as meat fondue or raclette. In almost all families in all parts of Germany you find a wide variety of Christmas cookies baked according to recipes typical for the family and the region. "Lüttenweihnachten" describes the hunting and forestry custom of providing a Christmas tree with food decorated for animals. The 2007 story "Erna, der Baum nadelt" (Erna, the fir tree's needles fall") describes a botanic drama involving a scientific rescue mission related to Christmas by Robert Gernhardt, Bernd Eilert and Peter Knorr in various German dialects. Humorist Loriot' film "Weihnachten bei Hoppenstedts" of 1997 involves a model nuclear station exploding under the tree and has Prussian educated Grandfather Hopenstedt humming the Helenenmarsch with "ra-da-buff" and asking for more Lametta ("Früher war mehr Lametta!" both statements became proverbial). Christmas Eve (December 24) is celebrated as Štědrý den/Štedrý deň, which means "Generous Day", when the gifts are given in the evening. 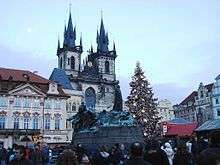 The December 25 and 26 are Public holidays in the Czech Republic and in Slovakia, but Vánoce/Vianoce (Christmas), is most commonly associated with the 24th. According to tradition, gifts are brought by Ježíšek/Ježiško, or "baby Jesus". Fish soup and breaded roasted carp with special homemade potato salad are a traditional dish for the dinner. In Slovakia, before eating, everyone exchanges Christmas greetings with each other by sharing a piece of Christmas wafer (Oblátky) with honey and walnuts. Traditional dinner depends on region, but common Christmas dinner is cabbage soup (Kapustnica) or lentil soup and breaded roasted carp with special homemade potato salad or hand made gnocchi with poppy (šúľanky s makom). The gifts are surreptitiously placed under the Christmas tree (usually a spruce or pine and lately fir), usually just before or during dinner. Children have to wait for the ringing of a Christmas bell (one of the decorations on the Christmas tree) - the sign that Ježíšek/Ježiško (little Jesus) has just passed by - to run for the presents. That happens at the end of their Christmas dinner. There is a rich tradition of hard baked Christmas sweets (Cukroví/vianočné koláče). Other Czech and Slovak Christmas traditions involve predictions for the future. Apples are always cut crosswise: if a perfect star appears in the core, the next year will be successful, distorted star means a bad year or illness, while a cross may suggest death. Girls throw shoes over their shoulders - if the toe points to the door, the girl will get married soon. Another tradition requires pouring some molten lead into water and guessing a message from its shapes. In Catholic Slovakia, the tradition of Jasličkári involves young men dressed as shepherds or angels visiting their neighbors and presenting recitations and songs about the story of the birth of Jesus. The Christmas and gift-giving season starts relatively early compared to other cultures, with the Santa-like figure, or Hungarian version of Saint Nicholas, Mikulás (or Szent Miklós) traditionally visiting the homes of Hungarian children on the night of December 5, on the eve of Saint Nicholas Feast Day, December 6. Although the role of gift-giver on Christmas Day itself is assigned to the Christ Child, on the night before St. Nicholas Day Hungarian children traditionally place a boot on their windowsill waiting for Mikulás to come by and fill it with treats. In Hungary, celebrations begin with Christmas tree decoration and gift packaging during daytime on December 24, then comes a family dinner with traditional Christmas meals. In some parts of Hungary, a traditional supper called fish soup halászlé is served at Christmas Eve meal, although it is also consumed at other times of the year. The day is otherwise a fast-day. In the evening (Christmas Eve, in Hungarian: Szenteste) the Angel or the Little (Baby) Jesus (Hungarian: Kisjézus or Jézuska) delivers the presents. This is the most intimate moment of Christmas, featuring warmly lit Christmas tree and candles, soft Christmas music, family singing of Christmas or religious songs and gift pack openings. There is also a popular folk custom during December and especially on Christmas Eve, in which children or adults present the birth of Jesus. The custom is called 'playing Bethlehem' (Hungarian: Betlehemezés), and it is an acting performance, where the 'actors' are wearing costumes, and telling stories about the three kings, the shepherds, Mary, Joseph and of course the birth of the Holy Child. A Christmas crib and a church are used as the scene. The actors go from house to house, and they receive gifts for their performance. Carollers walk from house to house receiving treats along the way. In the largely Roman Catholic Poland, Christmas Eve begins with a day of fasting and then a night of feasting. 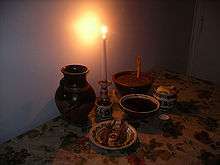 The traditional Christmas meal is known as Wigilia ("The Vigil"), and being invited to attend a Wigilia dinner with a family is considered a high honour. On the night of Christmas Eve, the appearance of the first star in the sky is watched for, in remembrance of the Star of Bethlehem, that it has been given an affectionate name of "the little star" or Gwiazdka (the female counterpart of St. Nicholas). On that evening, children watch the sky anxiously hoping to be the first to cry out, "The star has come!" After the first star appearance is declared, the family members sit down to a dinner table. According to tradition, bits of hay are spread beneath the tablecloth as a reminder that Christ was born in a manger. Others partake in the practice of placing money under the table cloth for each guest, in order to wish for prosperity in the coming year. The dinner contains twelve dishes, one for each Apostle. In many homes, an extra place setting is set. The empty setting is symbolically left at the table for a lonely wanderer who may be in need of food, an angel, the Baby Jesus or the Holy Spirit should appear to share the feast. Before eating, everyone exchanges Christmas greetings with each other. The supper begins with the breaking of the opłatek. By sharing a piece of Christmas wafer (Opłatki), when everyone at the table breaks off a piece and eats it as a symbol of their unity with Christ. The opłatek is usually blessed by the presiding Bishop, and stamped with a religious image, such as the nativity scene, they then share a piece with each family member. A tradition exists among some families to serve twelve different dishes at Wigilia symbolizing the Twelve Apostles, or perhaps, an odd number of dishes for good luck (usually five, seven, or nine). Some practice the superstition that an even number of people must be seated around the table. A traditional Wigilia supper in Poland includes fried carp and barszcz (beetroot soup) with uszka (translated as "little ears", also known as meatless ravioli). The most common dishes are fish soup, with potato salad, pierogi, gołąbki filled with kasza, pickled herring and fruit kompot. Carp provides a main component of the Christmas Eve meal across Poland; carp fillet, carp in aspic etc. Universal Polish Christmas foods are pierogi as well as some herring dishes, herring fillets, herring in aspic and for dessert, makowiec or noodles with poppy seed. Often, there is a compote of dry fruits for a drink. etc. Dishes beside fish are usually cabbage-, forest mushroom- (like boletus) and poppyseed-based, with herring being very important. After supper the Star Man arrives attended by the Star Boys. They are dressed as Wise Men or animals or other figures. The Star Man examines the children in their catechism and rewards them with small presents if they do well, even if they need a bit of coaching. The Star Boys sing carols and are given a treat for their help. The feast begins with the appearance of the first star. The meal is followed by the exchange of gifts. The remainder of the evening is given to stories and songs around the Christmas tree. In some areas of the country, children are taught that "The Little Star" brings the gifts. As presents are unwrapped, carollers may walk from house to house receiving treats along the way. The following day is often spent visiting friends. The giftbearer varies. In some regions it is Święty Mikołaj (Saint Nicholas), in others Święty Mikołaj gives his gifts on December 6 and the giftbringer of the Christmas Eve is Gwiazdor ("star man"), Aniołek ("little angel") or Dzieciątko ("baby Jesus"). Christmas (Romanian: Crăciun) in Romania is on December 25 and is generally considered the second most important religious Romanian holiday after Easter. In Moldova, although Christmas is celebrated on December 25 like in Romania, January 7 is also recognized as an official holiday. Celebrations begin with the decoration of the Christmas tree during daytime on December 24, and in the evening (Christmas Eve, in Romanian: Ajunul Crăciunului) Moş Crăciun (Father Christmas) delivers the presents. The singing of carols is a very important part of Romanian Christmas festivities. On the first day of Christmas, many carolers walk through the streets of the towns and villages, holding a star made of cardboard and paper on which are depicted various scenes from the Bible. Romanian tradition has the smallest children going from house to house, singing carols and reciting poems and legends during the whole Christmas season. The leader of the group carries with him a star made of wood, covered with metal foil and decorated with bells and coloured ribbons. An image of the Nativity is painted on the star's centre, and this piece of handiwork is attached to the end of a broom or other long stick. Romanian food served during the holidays is a hearty multi-coursed meal, most of which consists of pork (organs, muscle, and fat). This is mainly a symbolic gesture for St. Ignatius of Antioch. Since the 1880s, the Christmas customs of the Caucasus and Eastern Slavic countries have included a similar character known as Ded Moroz ("Grandfather Frost"). According to legend, he travels in a magical sanki — a decorated sleigh drawn by reindeer (or three white horses). With his young, blond assistant Snegurochka (the "Snow Maiden", said to be his granddaughter) at his side, he visits homes and gives gifts to good children (not true for former Yugoslavian countries). He only delivers presents to children while they are asleep, and unlike Santa, he does not travel down chimneys, coming instead to the front door of children's homes. It is traditional for children to leave food for Ded Moroz. This Ded Moroz (in Russia, Ded Moroz) is not identified nor in any way associated with Saint Nicholas of Myra (feast day, December 6), who is very widely revered in Eastern Europe for his clerical and charitable works as a bishop. In all likelihood, Ded Moroz is actually in Slavic tradition like Santa Claus, any connection to the original saint having long since disappeared. Armenians usually celebrate Christmas on January 6. The reason for this unusual date emerges from ancient history. “In the fourth century Roman Catholic Church, officials established the date of Christmas as December 25th.”  Before that time, Armenians celebrated Christmas (surb tsnunt, Սուրբ Ծնունդ, meaning "Holy Birth") on January 6 as a public holiday in Armenia. It also coincides with the Epiphany. The Armenians denied the new Roman mandate regarding Christmas, and continued to celebrate both the Nativity and Jesus’ baptism on January 6. When the Gregorian calendar was implemented in 1582, the Armenians rejected the reformed calendar and remained following the Julian Calendar. Today, the Armenian Orthodox Church still uses the Julian Calendar. Since the Julian calendar is thirteen days ahead of the Gregorian Calendar, when the Armenians celebrate Christmas on January 6 according to the Julian calendar the Gregorian calendar counts the day as January 19. Traditionally, Armenians fast during the week leading up to Christmas avoiding all meat, eggs, and dairy products. 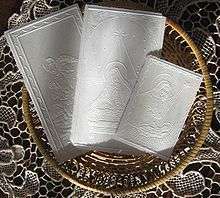 Devout Armenians may even refrain from food for the three days leading up to the Christmas Eve, in order to receive the Eucharist on a "pure" stomach. Christmas Eve is particularly rich in traditions. Families gather for the Christmas Eve dinner (khetum, Խթում), which generally consists of: rice, fish, nevik (նուիկ, a vegetable dish of green chard and chick peas), and yogurt/wheat soup (tanabur, թանապուր). Dessert includes dried fruits and nuts, including rojik, which consists of whole shelled walnuts threaded on a string and encased in grape jelly, bastukh (a paper-like confection of grape jelly, cornstarch, and flour), etc. This lighter menu is designed to ease the stomach off the week-long fast and prepare it for the rather more substantial Christmas Day dinner. Children take presents of fruits, nuts, and other candies to older relatives. “On the eve of the Feast of the Nativity and Theophany of The Lord Jesus Christ, the Jrakalouyts Divine Liturgy (the lighting of the lamps service) is celebrated in honor of the manifestation of Jesus as the Son of God (theophany)”  In addition to the Christmas tree (tonatsar, Տօնածառ), Armenians (particularly in the Middle East) also erect the Nativity scene. Christmas in the Armenian tradition is a purely religious affair. Santa Claus does not visit the nice Armenian children on Christmas, but rather on New Year's Eve. The idea of Santa Claus existed before the Soviet Union and he was named kaghand papik (Կաղանդ Պապիկ), but the Soviet Union had a great impact even on Santa Claus. Now he goes by the more secular name of Grandfather Winter (dzmerr papik, Ձմեռ Պապիկ). On calendars in Georgia, Christmas (Georgian: შობა, shoba) is celebrated on January 7 (December 25 on the Julian calendar). It is traditional in Georgia to go on Alilo (a modified pronunciation of Alleluia), a mass walk in the streets, dressed in special clothing to celebrate and congratulate each other. Most members of the Alilo march are children and they are given sweets by the adults. The Alilo carols vary across the provinces of Georgia. In most songs these words are used: "ოცდახუთსა დეკემბერსა, ქრისტე იშვა ბეთლემსაო'" (otsdakhutsa dekembersa qriste ishva betlemsao) – "on 25th December Christ was born in Bethlehem". A local variant of the Christmas tree, called Chichilaki, is made of soft wooden material with curled branches. Sometimes it is hazelnut branch which is carved into a Tree of Life-like shape and decorated with fruits and sweets. The Western custom of a Christmas tree (nadzvis khe) is also popular and has been imported through Russia. The Georgian equivalent of "Santa Claus" is known as tovlis papa (or tovlis babua in western Georgian dialects), literally meaning a "Grandfather snow", and is traditionally portrayed with long white beard, dressed in national costume "chokha" and wearing a fur cloak "nabadi". As in some other Eastern Orthodox countries, and due to the 13-day difference between the newer Gregorian, and older Julian Calendars, Christmas is celebrated on January 7. Unlike its Western counterparts, Christmas is mainly a religious event in Russia. On Christmas Eve (January 6), there are several long services, including the Royal Hours and Vespers combined with the Divine Liturgy. The family will then return home for the traditional Christmas Eve "Holy Supper", which consists of 12 dishes, one to honor each of the Twelve Apostles. Devout families will then return to church for the "всеночная" All Night Vigil. Then again, on Christmas Morning, for the "заутренняя" Divine Liturgy of the Nativity. Since 1992 Christmas has become a national holiday in Russia, as part of the ten-day holiday at the start of every new year. During the Soviet period, religious celebrations were discouraged by the officially atheist state. Christmas tree and related celebrations were gradually eradicated after the October Revolution. In 1935, in a surprising turn of state politics, the Christmas tradition was adopted as part of the secular New Year celebration. These include the decoration of a tree, or "ёлка" (spruce), festive decorations and family gatherings, the visit by gift-giving "Ded Moroz" (Дед Мороз "Grandfather Frost") and his granddaughter, "Snegurochka" (Снегурочка "The Snowmaiden"). Many of these were brought to Russia by Peter the Great after his Western travels in the late 17th century. Sviata Vecheria or "Holy Supper" is the central tradition of the Christmas Eve celebrations in Ukrainian homes and takes place in most parts of the country on January 6. In Western Ukraine, especially in Carpathian Ruthenia, due to historical multi-culturism, Christmas can be observed twice—on December 25 and January 7, often irrespective of whether the family belongs to Ukrainian Greek Catholic Church, the (Roman) Catholic Church, one of the Ukrainian Orthodox Churches, or one of the Protestant denominations. When the children see the first star in the eastern evening sky, which symbolizes the trek of the Three Wise Men, the Sviata Vechera may begin. In farming communities the head of the household now brings in a sheaf of wheat called the didukh which represents the importance of the ancient and rich wheat crops of Ukraine, the staff of life through the centuries. Didukh means literally "grandfather spirit" so it symbolizes the family's ancestors. In city homes a few stalks of golden wheat in a vase are often used to decorate the table. The dinner table sometimes has a few wisps of hay on the embroidered table cloth as a reminder of the manger in Bethlehem. A prayer is said and the father says the traditional Christmas greeting, "Chrystos rodyvsya!" which is translated to "Christ is born! ", which is answered by the family with "Slavite Yoho!" which means "Let us glorify him!". In some families the Old Slavic form "Сhrystos rozhdayetsya!" is used. At the end of the Sviata Vechera the family often sings Ukrainian Christmas Carols. In many communities the old Ukrainian tradition of caroling is carried on by groups of young people and members of organizations and churches calling at homes and collecting donations. Traditionally, Christmas Day opens for Ukrainian families with attendance at Church. Ukrainian Churches offer services starting before midnight on Christmas Eve and on Christmas morning. Christmas supper, without Lenten restrictions, does not have as many traditions connected with it as Sviata Vechera. The old tradition in Ukraine of giving gifts to children on St. Nicholas Day, December 19, has generally been replaced by the Christmas date and it is the Father Frost who visits all the children in a sleigh pulled by only three reindeer. In much of Northern Europe Christmas is celebrated on December 24 and is referred to as Jul (see Yule), while December 25 is a relaxed day for visiting relatives. "Yule" may come from the Norse word hweol, jól, meaning wheel, and Old English géol. The Norse believed that the sun was a great wheel of fire that rolled towards and then away from the earth. 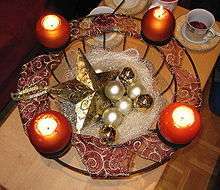 Danes celebrate on December 24, which is referred to as Juleaften (literally "Yule evening"). An evening meal with the family consists of either roast pork, roast duck or roast goose and eaten with potatoes, plenty of gravy, and red cabbage or finely chopped kale boiled in butter. Also caramelized potatoes is an important part of the Dane's Christmas dinner. For dessert rice pudding is traditionally served - composed largely of whipped cream and accompanied by lashings of black cherry sauce. The rice pudding also contains chopped peeled almonds, and a single whole peeled almond. Whoever finds the whole almond will have good luck for the coming year, and the lucky finder is entitled to a small gift, Mandelgave. After the meal is complete, the family gathers around the Christmas tree and sings Christmas songs and hymns while holding hands and dancing in circles, and may even tour the house, still holding hands and singing. When the singing is complete, traditions vary. In some traditions, the family will select one child to hand out the presents. All children take turns handing out presents in other traditions. Alternatively "Santa Claus", the Julemanden, will appear at the door in full costume with a large sack of presents over his shoulder. 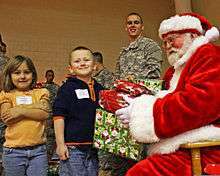 He will then distribute the presents, with the assistance of any children present, to their recipients. He should be offered suitable drink to keep him warm and cheerful on his onward journey, but do not expect loquacity - utterances are normally limited to loud and hearty laughs. Meanwhile, the presents are opened and this is followed by more snacks, candy, chips and, sometimes, a traditional Christmas drink called Gløgg. The Danish are somewhat famous for their Julefrokost, literally meaning "Christmas lunch", which includes various traditional Danish dishes, potentially accompanied by beer and Snaps. These Julefrokoster are popular and held within families, as well as by companies and other social groups. They would traditionally have taken place leading up to Christmas, but due to time constraints and stress during the Christmas month they are nowadays commonly held during November and January as well. 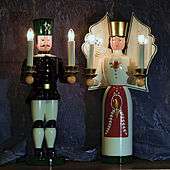 The family Julefrokoster however are normally held on Christmas Day and/or The Second day of Christmas (December 26). Another more recent Danish tradition is the concept of television Julekalendere, special Christmas-themed, advent calendar-type television programmes with a daily episode shown on each of the first 24 days of December, thus culminating on Juleaften. Several television stations produce their own, most, but not all of which are targeted at child viewers. Some of the television advent calendars become extremely popular and go on to be reprised in subsequent years. In Denmark, Santa Claus is known as Julemanden (literally "the Yule Man") and is said to arrive in a sleigh drawn by reindeer, with presents for the children. He is assisted with his Yuletide chores by elves known as julenisser (or simply nisser), who are traditionally believed to live in attics, barns or similar places. In some traditions, to maintain the favour and protection of these nisser, children leave out saucers of milk or rice pudding or other treats for them and are delighted to find the food gone on Christmas morning. In the weeks preceding Christmas or jõulud, children place a slipper in their windows and receive a piece of candy or some other sweets from visiting elves (päkapikud). Estonians celebrate Christmas on December 24, which is referred to as jõululaupäev ("Christmas Saturday") and is by act of Parliament a public holiday in Estonia. Each year on this day, the President of Estonia declares the Christmas Peace and attends a Christmas service. The tradition was initiated by the order of Queen Christina of Sweden in the 17th century. Estonian children are visited by jõuluvana ("Santa Claus") on Christmas Eve, and must sing songs or recite Christmas poems before receiving their gifts. The evening meal typically includes pork with sauerkraut or Estonian sauerkraut (mulgikapsad), baked potatoes, white and blood sausage, potato salad with red beet, and pāté. For dessert, Estonians eat gingerbread (piparkoogid) and marzipan. The most highly regarded drinks during this time have been beer and mulled wine or glögi and hõõgvein ("glowing wine"). Estonians leave the leftover food from Christmas dinner on the table overnight, in hopes that the spirits of family, friends, and loved ones will visit and also have something to eat. It is also customary to visit graveyards and leave candles for the deceased. December 25 or jõulupüha is a relaxed day for visiting relatives. Christmas is an extensively prepared celebration centering on the family and home, although it has a religious dimension also. The Christmas season starts from December or even in late November, when shops began advertising potential Christmas gifts. Christmas decorations and songs become more prominent as Christmas nears, and children count days to Christmas with Advent calendars. 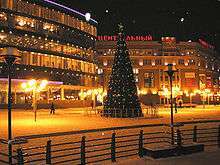 Schools and some other places have the day before Christmas Eve (aatonaatto, December 23) as a holiday, but at the latest on the Christmas Eve (jouluaatto, December 24), shops close early and stay closed until December 26. The main Christmas festivities are held on Christmas Eve on December 24, while Christmas Day (joulupäivä) and the following day (Tapaninpäivä, "St. Stephen's Day") are mandatory public holidays in Finland Schools continue holidays up to the New Year. Tomorrow, God willing, is the most gracious feast of the birth of our Lord and Saviour, and therefore a general Christmas peace is hereby declared, and all persons are directed to observe this holiday with due reverence and otherwise quietly and peacefully to conduct themselves, for whosoever breaks this peace and disturbs the Christmas holiday by any unlawful or improper conduct shall be liable, under aggravating circumstances, to whatever penalty is prescribed by law and decree for each particular offence or misdemeanour. Finally, all citizens are wished a joyous Christmas holiday. The ceremony ends with trumpets playing the Finnish national anthem Maamme and Porilaisten marssi, with the crowd usually singing when the band plays Maamme. Recently, there is also a declaration of Christmas peace for forest animals in many cities and municipalities, so there is no hunting during Christmas. Finnish people clean their homes well before Christmas and prepare special treats for the festive season. A sheaf of grain, nuts and seeds are tied on a pole, which is placed in the garden for the birds to feed on. Spruce trees are cut or bought from a market and taken to homes on or a few days before Christmas Eve and are decorated. 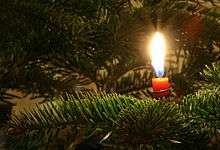 Candles are lit on the Christmas tree, which is traditionally decorated using apples and other fruit, candies, paper flags, cotton and tinsel, in addition to Christmas ornaments such as stars or baubles. Actual candles are no longer used, being replaced by incandescent or LED lamps. A star symbolizing the Star of Bethlehem is placed at the top of the tree. Just before the Christmas festivities begin, people usually take a Christmas sauna. The tradition is very old; unlike on normal days, when one would go to the sauna in the evening, on Christmas Eve it is done before sunset. This tradition is based on a pre-20th century belief that the spirits of the dead return and have a sauna at the usual sauna hours. Afterwards, they dress up in clean clothes for the Christmas dinner or joulupöytä, which is usually served between 5pm and 7pm, or traditionally with the appearance of the first star in the sky. The most traditional dish of the Finnish Christmas dinner is probably Christmas Ham, roast suckling pig or a roasted fresh ham, but some may prefer alternatives like turkey. Several sorts of casseroles, like rutabaga, carrot and potato casserole are traditional, and are almost always exclusively served on Christmas. Other traditional Christmas dishes include boiled codfish (soaked beforehand in a lye solution for a week to soften it) served snowy white and fluffy, pickled herring and vegetables. Prune jam pastries, plum or mixed fruit soup, rice porridge with cinnamon, sugar and cold milk, and sweets like chocolate are popular desserts. Christmas gifts are usually exchanged after Christmas Eve dinner. Children do not hang up stockings in Finland but Joulupukki visits the household, maybe with a tonttu to help him distribute the presents. Christmas Day services begin early at six in the morning and people visit families and reunions are arranged on this day. Boxing Day, or tapaninpäivä (St. Stephen's Day) is traditionally set aside for driving around the village (tapaninajot), to counterbalance the solemn and family-oriented part of Christmas. The Christmas or Yule (Jól in Icelandic) celebration in Iceland starts four Sundays before Christmas proper, which begins on December 24 (Advent) and ends thirteen days later on January 6. Traditionally, one candle is lit each Sunday until four candles are lit on the 24th. At 6:00 pm Church bells ring to start the Christmas celebration. The religiously observant and/or traditional Icelanders will attend mass at this time while the secular Icelanders will begin their holiday meal immediately. After the meal is finished, they open gifts and spend the evening together. In Iceland people over the Yule holidays most often eat Most popular dishes are smoked lamb, ptarmigan and turkey. Pork is also very popular. Thirteen days before December 24 the Yule Lads children will leave their shoes by the window so that the Yule Lads can leave small gifts in their shoes. The Yule Lads are the sons of two trolls living in the Icelandic mountains. Each of the Yule Lads is known for a different kind of mischief (for example slamming doors, stealing meat, stealing milk or eating the candles). The Yule Lads traditionally wear early Icelandic wool clothing but are now known for the more recognizable red and white suit. Each home typically sets up a Christmas tree indoors in the living room with most decorating it on December 11. In addition to the decorations, presents are put underneath the tree. It is also a tradition in many homes to boil skate on the 23rd. The day is called Saint Thorlak Mass (Þorláksmessa). During the holiday season, it is traditional for families to work together to bake small cookies to serve or give to guests. Most common are thin gingerbread cookies which are decorated in many different colors of glaze. Many families also follow the tradition of making Laufabrauð (Leafbread), which is a flat thin bread that is cut out using a special tool and folding technique. The end of year is divided between two days - the Old Year's Day (Gamlársdagur) and the New Year's Day (Nýársdagur). At the night of the former and morning of the latter Icelanders shoot up fireworks blowing the old year away and welcoming the new one. Thirteen days after the 24th Icelanders say goodbye to the Yule Lads and other mystical creatures such as elves and trolls. There are bonfires held throughout the country while the elves, Yule Lads, and Icelanders dance together before saying goodbye until the next Christmas. The major day of celebration in Norway, as in most of Northern Europe, is December 24. Although it is legally a regular workday until 16:00, most stores close early. Church bells chime in the Christmas holiday between 17:00 and 18:00. In some families the Christmas story from Luke 2 will be read from the old family Bible. The main Christmas meal is served in the evening. Common main dishes include pork rib, "pinnekjøtt" (pieces of lamb rib steamed on a grid of birch wood). Many people also eat "lutefisk" or fresh, poached cod. Rice porridge is also popular (but most commonly served as an early lunch rather than for the main Christmas dinner), an almond is often hidden in the porridge, and the person who finds it wins a treat or small gift. In some parts of Norway it is common to place porridge outside (in a barn, outhouse or even in the forest) to please "Nissen". In many families, where the parents grew up with different traditions, two different main dishes are served to please everyone. If children are present (and they have behaved well the last year), "Julenissen" (Santa Claus) pays a visit, otherwise gifts are stored under the Christmas tree. For a lot of Norwegians, especially families, television is an important part of the earlier hours of Christmas Eve. Many Norwegians do not feel the Christmas spirit until they have watched the Czech-German fairy tale Three Nuts for Cinderella (Norwegian title: Tre nøtter til Askepott), the Disney Christmas cavalcade From All of Us to All of You the Norwegian fairytale movie Reisen til Julestjernen or the comedy sketch Dinner for One. Attending one of the many stage productions of Putti Plutti Pott and Santa's Beard is also a very popular tradition. December 25 is a very quiet and relaxed day. Church services are well attended. The old tradition of a very early morning service before breakfast has been replaced in most areas by a service in the later morning. Afterward many families get together for a large festive meal. December 26 is also a day of many festivities. Cinemas, night clubs and bars are full, and there are lots of private gatherings and parties, where all kinds of traditional Christmas cookies and sweets are enjoyed. Fatty, tasty dinners are also part of it. The time between Boxing Day and New Year's Eve is called romjul. During this time children in some parts of Norway dress up as "nisser" and go "Julebukk" – "Christmas goat" – in their neighbourhoods and sing Christmas carols to receive treats, much the same way as in the American Halloween. January 6 (13th day of Christmas) is commonly regarded as the end of Christmas, while some end Christmas on the 20th day, and some even at Candlemas. The pre-Christian holiday of Yule, or jól, was the most important holiday in Scandinavia and Northern Europe. Originally the observance of the winter solstice, and the rebirth of the sun, it brought about many practices that remain in the Advent and Christmas celebrations today. The Yule season was a time for feasting, drinking, gift-giving, and gatherings, but also the season of awareness and fear of the forces of the dark. Swedish Christmas celebrations begin with the first of Advent. Saint Lucy's Day (locally known as Luciadagen) which is the first major Christmas celebration before Christmas itself. The eldest daughter arising early and wearing her Lucy garb of white robe, red sash, and a wire crown covered with whortleberry-twigs with nine lighted candles fastened in it awakens the family, singing "Santa Lucia", serving them coffee and saffron buns (St. Lucia buns), thus ushering in the Christmas season. Schools elect a Lucia and her maids among the students and a national Lucia is elected on national television from regional winners. The regional Lucias will visit shopping malls, old people's homes and churches, singing and handing out pepparkakor gingerbread cookies. Christmas is, as everywhere else, an occasion celebrated with food. Almost all Swedish families celebrate on December 24 with a Christmas table, called Christmas smörgåsbord (julbord), a display of several Christmas food items. Almost all julbord has Christmas ham, (julskinka) accompanied by other Christmas dishes, such as small meatballs, pickled herring, spareribs, small hot dogs, lutfisk, pork sausage, salmon, Janssons frestelse (potato casserole with anchovy), and rice pudding. The Christmas julbord is served with julmust and beverage like mulled wine, Christmas beer or snaps. A Scandinavian speciality is the glögg (mulled and spiced wine with almonds and raisins), which is served hot in small cups. The different dishes of the julbord may vary throughout Sweden, from South to North. Businesses traditionally invite their employees to a julbord dinner or lunch the weeks before Christmas, and people go out privately to restaurants which also customarily offer julbord during December. 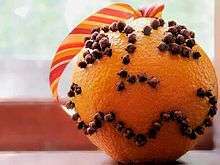 Examples of candies and treats associated with Christmas are marzipan, toffee, knäck (quite similar to butterscotch), nuts and fruits: figs, chocolate, dates and oranges decorated with cloves. Television also plays a big role, many families watch the Disney Christmas special Kalle Anka och hans vänner önskar God Jul (From All of Us to All of You), Karl Bertil Jonssons julafton (animated short), or a re-run of the Svensson, Svensson episode God Jul! (Merry Christmas) on the TV channel SVT1. 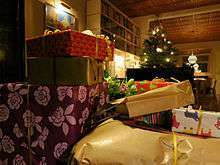 After the julbord on December 24, the presents are distributed, either by Jultomten or a family member, and usually from a sack or from under the Christmas tree where they have been lying all day or for several days. Many Swedes still adhere to the tradition that each present should have a rhyme written on the wrapping paper, to hint at the contents without revealing them. In older days a yule goat was an alternative to Jultomten, nowadays it is used as an ornament, ranging from sizes of 10 cm to huge constructions like the giant straw Christmas Gävle goat, famous for frequently being vandalised or burnt down. If one has two families to celebrate Christmas with, it is common that one of the families move their celebrations to Christmas Day or the day before Christmas Eve (commonly referred to as little Christmas Eve). After December 24, the Christmas celebrations have more or less come to an end. Some people attend the julottan, an early morning church service on December 25. This particular service was the main service of Christmas historically—nowadays, the Midnight Mass has become increasingly popular. Others attend a simpler service called Christmas Prayer in the afternoon of Christmas Eve; however, many Swedes do not attend church at all during Christmas as the country is very secular. Even so, most families do set up a Julkrubba (Christmas Crib). On January 13 (locally known as knutdagen or tjugondag knut, English = twentiethday Christmas), 20 days after Christmas, the Christmas celebrations come to an end and all Christmas decorations are removed. In Bosnia and Herzegovina, Croatia and Slovenia, Christmas (Croatian: Božić, Slovene: Božič) is celebrated mainly as a religious holiday. The festivities begin on Saint Nicholas's Day on December 6 (in Slovenia) or St. Lucy's on December 13 depending on what region (in Croatia). St. Lucy or St. Nicholas brings children presents, and St. Nicholas is said to be accompanied by Krampus who steals away the presents of bad children. This "anti-Santa" is said to have one cloven hoof, a handful of heavy chains, and a sack on his back to collect naughty children. In Croatia on St. Lucy's, families will plant wheat seeds in a bowl of shallow water, which will grow several inches by Christmas and are then tied together with a red, blue and white ribbon called trobojnica'. On Christmas Eve (Croatian: Badnjak, Slovene: Sveti večer (holy eve)), three candles representing the Trinity are lit and placed in the middle of the wheat, the glow symbolizes the soul of each person. On this day, the tree is decorated, the home is decked with greenery and the women already beginning to prepare the Christmas meal. They also bake special types of bread: one is round inscribed with a cross on top known as the cesnica, another is made with honey, nuts and dried fruit called the Christmas Eve Bread (Croatian: Badnji Kruh, Slovene: Božični kruh). In many villages, straw (which symbolizes Christ's birth in the manger) is spread around the floors of the home for the Christmas Eve dinner. As is customary with Catholic people, meat is not consumed in Croatia, while in Slovenia it is. Instead of meat in Croatia and with other food in Slovenia, salad and fish is served, many choosing to eat the Dalmatian specialty bakalar, dried cod fish. The family then sprinkle holy water on their Yule log (badnjak) which they light and watch. In villages, the badnjak is freshly cut that very morning by the father of the household while reciting traditional prayers. At the end of the meal, a piece of the cesnica is cut and dipped in wine and used to sprinkle on the candles to extinguish them, while reciting the Trinitarian formula ("In the name of the Father, the Son, and the Holy Spirit. Amen"). Many families will go to a midnight mass on Christmas Eve and often another on Christmas Day. It is common for Christmas presents to be placed under the tree, to suggest that the Angel or the Baby Jesus (Mali Isus) leaves them there while others are attending midnight mass. Presents are opened after the mass. Christmas is a day of celebrating with family; a large feast is prepared and traditional foods such as stuffed cabbage, turkey, pot roast, pita and smoked meat are served, along with various desserts such as fritule, potica (especially in Slovenia), strudel, and cookies. Slovenes are also visited by another one of their trije dobri možje (three good guys), who bring presents in December: Saint Nicholas, Santa Claus and Dedek Mraz ("Grandfather Frost"). Families mostly celebrate New Year's Eve at home with extended family members, friends, and sometimes neighbours. Women prepare cabbage sarma, which they will eat on January 1 to symbolize good fortune, and steak tartare, which they eat on New Year's Eve on toast with butter. At midnight, people go outdoors to watch fireworks, while Dedek Mraz leaves presents under the tree. Epiphany on January 6 marks the end of the Christmas season. In Bulgaria, Christmas (Bulgarian: Коледа, Koleda or more formally Рождество Христово, Rozhdestvo Hristovo, "Nativity of Jesus") is celebrated on December 25 and is preceded by Christmas Eve (Бъдни вечер, Badni vecher). Traditionally, Christmas Eve would be the climax of the Nativity Fast, and thus only an odd number of lenten dishes are presented on that evening. The table is usually not cleared after the dinner and until the next morning, to leave some food for the holy spirits – a custom which probably comes from pagan pre-Christian times. On that day, a Bulgarian budnik is set alight. On Christmas, however, meat dishes are already allowed and are typically served. Among the Bulgarian Christmas traditions is koleduvane, which involves boy carolers (коледари, koledari) visiting the neighbouring houses starting at midnight on Christmas Eve, wishing health, wealth and happiness. 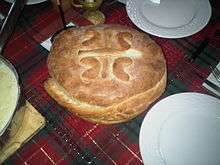 Another custom is the baking of a traditional round loaf (пита, pita). The pita is broken into pieces by the head of the family and a piece is given to each family member, a valuable possession, and a piece for God. A coin is hidden inside the pita and whoever gets the coin, he or she will have luck, health, and prosperity in the coming year. As in other countries, a Christmas tree is typically set up and the entire house is decorated. The local name of Santa Claus is Dyado Koleda (Дядо Коледа, "Grandfather Christmas"), with Dyado Mraz (Дядо Мраз, "Grandfather Frost") being a similar Russian-imported character lacking the Christian connotations and thus popular during the Communist rule. However, it has been largely forgotten after 1989, when Dyado Koleda again returned as the more popular figure. The festive period lasts from November 30 to January 6 (Epiphany) on the Greek calendar. December 25 and 26 is a public holiday in Greece. In Greek, Christmas is known as Christougena (Χριστούγεννα) and people wish Merry Christmas to each other saying Kala Christougenna (Καλά Χριστούγεννα). Most families set up Christmas trees and shops have decorations and lights. Presents are placed under the Christmas tree and are opened on January 1, St Basil's Day. In Greek tradition, Basil’s (of Caesarea) name was given to Father Christmas and is supposed to visit children and give presents on January 1 (when Basil's memory is celebrated), unlike other European traditions, where this person is Saint Nicholas and comes every Christmas. Carol singing is another tradition on Christmas and New Year’s Eve. The Christmas meal usually includes lamb or pork and desserts such as kourabies (κουραμπιές) and melomakarona (μελομακάρονα). Other Christmas and new year foods include 'Baklava' (sweet pastry), Kataifi (pastry), Theeples (a kind of fried pastry). Christmas Eve on December 24 and 23 housewives make the Christmas cake with a cross in the middle and avgokouloures which are subsequently offered to the elderly and children. Children singing carols from house to house either before or on Christmas Day. People go to church early the morning of Christmas on December 25. Christmas morning after church there is the practice to become the "pork batches," served with wine to open the appetite, and "thick," done by Eve, which is boiled pork with plenty of lemon that is left to clot overnight. The pork-food is in the hallmark of Greek Christmas. In many Greek cities and ports like Thessaloniki, Volos, Patra, the Greek Islands etc., it is decorated the traditional Christmas boat. 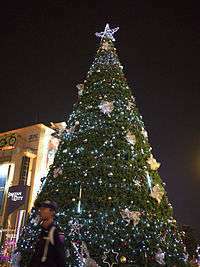 And in many central squares of the country a big Christmas tree, where many of the Christmas festivals take place. Some of the Christmas Festivals in Greece are "Ρουγκατσάρια" Rugatsariα, where all the residents of the city of Kastoria are delivered in a separate Dionysian revelry, with the accompaniment of folk melodies bodies all traditional musical sounds of the area. This ancient habit, whose origin is lost in time. In Mani there are beliefs about demonic and other supernatural beings, who come from the Twelve Days of Christ as the Epiphany. These are the goblins and say that they are the descendants God Pan or Satyrs, who jumped from the mythology in the Christian life. The Feast of the Immaculate Conception (Italian Festa dell'Immacolata Concezione) on December 8 is a national holiday in Italy. Christmas decorations, including the presepe (nativity scene), as well as the Christmas tree, are put up on this day. Some modern takes on this holiday involve them hanging vultures to symbolize the cleaning of their spirits. Saint Lucy's Day (Italian: Giorno di Santa Lucia) is celebrated as a Catholic holiday in Sicily and Northern regions of Italy on the supposed Shortest day of the year which is December 13. Saint Lucy is the patron saint of the city of Syracuse better known as Santa Lucia as she is called in the traditional Neapolitan song. Evening candlelight processions called the parade of light are conducted and are followed by the Feast of St. Lucy. Sicilians pay tribute to a miracle performed by St Lucy during a famine in 1582. At that time, she brought a flotilla of grain-bearing ships to starving Sicily, whose citizens cooked and ate the wheat without taking time to grind it into flour. Thus, on St. Lucy's Day, Sicilians do not eat anything made with wheat flour. Instead they eat cooked wheat called cuccia. Christmas is celebrated in Italy in a similar fashion to other Western European countries, with a strong emphasis given to the Christian meaning of the holiday and its celebration by the Catholic Church, also reinforced by the still widespread tradition of setting up the presepe, a tradition initiated by Saint Francis of Assisi. It is quite common to attend midnight mass on Christmas Eve and practice the custom not to eat any meat. The dinner traditionally consists of seafood, with the Feast of the Seven Fishes, followed by typical Italian Christmas sweets, such as pandoro, panettone, torrone, panforte, struffoli, caggionetti, Monte Bianco or others, depending on the regional cuisine. Christmas on the 25th is celebrated with a family lunch, consisting of different types of meat dishes, cheese and local sweets. The ancient Christmas festival called Ndocciata is celebrated on Christmas Eve in Molise with a parade of torches leading up to the "Bonfire of Brotherhood". On Christmas Eve, in the squares of many towns of the eastern Sicily, a big bonfire, U Zuccu, is lit to warm the Baby Jesus. Traditions regarding the exchanging of gifts vary from region to region, as this might take place either on Christmas Eve or on Christmas Day. Presents for children are left underneath the Christmas tree either by Santa Claus (called Babbo Natale) or, according to older traditions, by Baby Jesus himself. In some regions children receive gifts earlier (at St. Lucy's Day) or later (on Epiphany). December 26, (St. Stephen's Day, in Italian Giorno di Santo Stefano), is also a public holiday in Italy. Festivities extend to the end of the year and then to the Epiphany. On January 6 (Epiphany, in Italian Epifania) decorations are usually taken down, and in some areas female puppets are burned on a pire (called "falò"), to symbolize, along with the end of the Christmas period, the death of the old year and the beginning of a new one. While gifts are now given at Christmas by an American style Santa Claus as well, Italy holds fast to its tradition of native gift-givers. On the eve of the 6th, la Befana, the good Epiphany witch, is thought to ride the night skies on broomstick, bringing good children gifts and sweets, and bad ones charcoal or bags of ashes. In other areas it is the Three Wise Men who bring gifts, especially oranges symbolizing gold, and chocolate symbolizing their kisses to good children. In some municipalities, most famously in Milan, the custom of the "Corteo dei Re Magi" (Three Kings Procession) is elaboratedly celebrated with a parade welcoming the Wise Men, and the passing out of sweets. In other places, such as Treviso the day is celebrated with bonfires, the sparks of which are said to predict the future of the new year. Christmas (or Il-Milied, as it's known in Maltese) in Malta is mainly a religious affair since most of the population is Christian. Midnight Masses are very popular and traditional Christmas processions with a statue of the baby Jesus take place in the towns and villages of the islands on Christmas Eve, led by children attending the M.U.S.E.U.M. (Society of Christian Doctrine). However over the years, the island has adopted other popular Christmas customs and traditions such as the Christmas tree and Father Christmas. A public holiday in Malta, Christmas Day is celebrated on December 25 and is a time to spend with family. Christmas lunch usually consists of turkey served with potatoes and vegetables (reflecting the fact it's a former British colony). Presents are normally exchanged either on Christmas Eve or on Christmas Day. A local Christmas specialty is the "Qaghaq ta' l-Ghasel" or Honey Rings. These Maltese Christmas sweets are eaten as a dessert during the Christmas season but can also be purchased all year round. 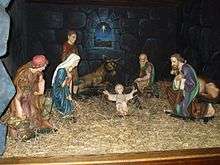 Christmas cribs (Nativity scenes) are a popular Christmas tradition and can be seen in most homes, alongside the Christmas tree and the child Jesus in a manger. Another Christmas tradition is the planting of ġulbiena common vetch seeds in flat-bottomed pots. These seeds are planted around the beginning of December, normally placed on white cotton and watered every day whilst being kept in the dark all the time. They are usually taken out just before Christmas, and resemble long white spaghetti-like strands of leaves (since they would have grown in the dark). Christmas, an official holiday in Portugal, is widely celebrated and is associated with family gatherings. People who have moved to the main cities, like Lisbon or Porto, or even those who have emigrated to other countries, still travel to their home towns and villages to spend Christmas Eve with their families. After the Missa do galo (Rooster's Mass) that celebrates the birth of Christ, families gather around the Consoada, the late supper held on Christmas Eve. The traditional dish is bacalhau com todos (dried codfish boiled with vegetables), although, in northern Portugal, the bacalhau is often replaced by octopus. The Christmas dinner usually ends with fatias douradas (golden slices), filhoses and sonhos (dreams), all desserts based on fried flour or fried bread. Another traditional cake is the king cake served on Epiphany. Nowadays, although Santa Claus (Pai Natal) is more popular, in some regions people still believe that it is the Menino Jesus (Baby Jesus) who brings presents to children. Serbs and Montenegrins celebrate Christmas for three consecutive days, beginning with Christmas Day. The Serbian Orthodox Church uses the traditional Julian calendar, per which Christmas Day (December 25) falls on January 7. This day is called the first day of Christmas, and the following two are accordingly called the second, and the third day of Christmas. During this festive time, one is to greet another person with “Christ is Born,” which should be responded to with “Truly He is Born.” The Serbian name for Christmas is Božić (Cyrillic: Божић, pronounced [boʒitɕ]), which means the young or little God. This holiday surpasses all the others celebrated by Serbs, with respect to the diversity of applied folk customs and rituals. These may vary from region to region, some of them having modern versions adapted to the contemporary way of living. The ideal environment to carry them out fully is the traditional multi-generation country household. In the morning of Christmas Eve a young, straight oak tree is selected and felled by the head of the household. A log is cut from it and is referred to as the badnjak. In the evening, the badnjak is ceremoniously put on the domestic fire that burns on the house’s fireplace called ognjište, whose hearth is without a vertical surround. The burning of the badnjak is accompanied by prayers to God so that the coming year may bring much happiness, love, luck, riches, and food. Since most houses today have no ognjište on which to burn a badnjak, it is symbolically represented by several leaved oak twigs. For the convenience of people who live in towns and cities, they can be bought at marketplaces or received in churches. 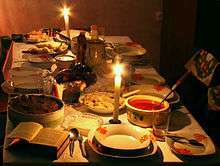 The dinner on this day is festive, copious and diverse in foods, although it is prepared in accordance with the rules of fasting. Groups of young people go from house to house of their village or neighbourhood, congratulating each other, singing, and making performances; this continues through the next three days. The Serbs also take a bundle of straw into the house and spread it over the floor, and then put walnuts on it. Before the table is served for the Christmas Eve dinner, it is strewn with a thin layer of straw and covered with a white cloth. The head of household makes the Sign of the Cross, lights a candle, and censes the whole house. The family members sit down at the table, but before tucking in they all rise and a man or boy among them says a prayer, or they together sing the Troparion of the Nativity. After the dinner young people visit their friends, a group of whom may gather at the house of one of them. Christmas and other songs are sung, while the elderly narrate stories from the olden times. On Christmas Day, the celebration is announced at dawn by church bells and by shooting. A big importance is given to the first visit a family receives that day. People expect that it will summon prosperity and well-being for their household in the ensuing year; this visit is often pre-arranged. Christmas dinner is the most celebratory meal a family has during a year. A special, festive loaf of bread is baked for this occasion. The main course is roast pork of a pig which they cook whole by rotating it impaled on a wooden spit close to an open fire. Even though gift-giving is not necessarily a part of the tradition, a Santa Claus inspired character called Božić Bata (translated as Christmas friend) sometimes takes his during gift giving, as Santa Claus is more traditionally connected to New Years celebrations. Gift-giving is, nevertheless, connected with the celebrations, being traditionally done on the three consecutive Sundays that immediately precede it. Children, women, and men, respectively, are the set gift-givers on these three days. Since the early 1990s, the Serbian Orthodox Church has, together with local communities, organized public celebrations on Christmas Eve. The course of these celebrations can be typically divided into three parts: the preparation, the ritual, and the festivity. The preparation consists of going and cutting down the tree to be used as the badnjak, taking it to the church yard, and preparing drink and food for the assembled parishioners. The ritual includes Vespers, placing the badnjak on the open fire built in the church yard, blessing or consecrating the badnjak, and an appropriate program with songs and recitals. In some parishes they build the fire on which to burn the badnjak not in the church yard but at some other suitable location in their town or village. The festivity consists of getting together around the fire and socializing. Each particular celebration, however, has its own specificities which reflect traditions of the local community, and other local factors. In Serbia, Montenegro and Macedonia Christmas is celebrated on January 7. This is a result of their Eastern Orthodox churches marking Christmas Day based on the Julian calendar, which is now 13 days behind the internationally used Gregorian calendar. Christmas and St Stephen's Day are officially recognized holidays in Spain. In most of Spain, the Christmas period, referred to as "Navidad", lasts from Christmas Eve referred to as "Nochebuena" or "the Good Night." on December 24 to Epiphany on January 6. Many homes and most churches display a Nativity scene, a Christmas tree, or both. The pesebre (nativity scene) is present in many homes, schools and stores. On the 26th, Sant Esteve (Saint Stephen) is celebrated with a family gathering. A large family dinner is celebrated on Christmas Eve (Nochebuena) and can last until 6 o'clock in the morning. There is a wide variety of typical foods one might find on plates across Spain on this particular night, and each region has its own distinct specialities. It is particularly common, however, to start the meal with a seafood dish such as prawns or salmon, followed by a bowl of hot, homemade soup. The main meal will commonly consist of roast lamb, or seafood, such as cod or shellfish. For dessert, there is quite a spread of delicacies, among them are turrón, a dessert made of honey, egg and almonds that is Arabic in origin. Special dishes and desserts include Mariscos y Pescado (shellfish and fish), marzipan, Pavo Trufado de Navidad (turkey with truffles), and polvorones (shortbread made of almonds, flour and sugar). Even though there is still the traditional Misa del Gallo at midnight, few Spaniards continue to follow the old custom of attending. Children usually receive one or two presents on Christmas Day (December 25), brought by "Papá Noel" (Father Noel), which is a non-traditional imitation of the American Santa Claus, but in some regions there are other more traditional characters, for example, the Olentzero in the Basque Country. There is a special Christmas dance called the Jota which is performed since last hundreds of years in Spain during Christmas. On December 31 (Nochevieja) there is also a large family feast. Some young people go out in "cotillón", a very big feast in bars and pubs and the drink and dance until January 1 morning, when they have churros with chocolate for breakfast. On January 5 a huge parade (La Cabalgata or cavalcade) welcomes the Three Kings to the city. Children put their shoes in the window on January 5 in the hope that the Three Wise Men will deliver them presents. 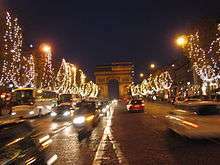 Christmas in France (Noël on the French calendar) is celebrated mainly in a religious manner, though secular ways of celebrating the occasion also exist, such as Christmas decorations and carols. Children do not hang Christmas stockings but put their shoes by the fireplace or under the Christmas tree so Père Noël (Father Christmas or Santa Claus) can give them gifts (a practice also among French-speaking Switzerland). Some families also attend midnight mass and decorate their homes with Nativity Scenes depicting the birth of Jesus. Additional Santons (little saints) may be added in the nativity scenes. In France and in other French-speaking areas (see French Canada), a long family dinner, called a réveillon, is held on Christmas Eve. The name of this dinner is based on the word réveil (meaning "waking"), because participation involves staying awake until midnight and beyond. Réveillon is generally of an exceptional or luxurious nature. Appetizers may include lobster, oysters, escargots or foie gras, etc. One traditional dish is turkey with chestnuts. Réveillons in Quebec will often include some variety of tourtière. Dessert may consist of a bûche de Noël. In Provence, the tradition of the 13 desserts is followed, almost invariably including: pompe à l'huile (a flavoured bread), dates, etc. Quality wine is usually consumed at such dinners, often with champagne or similar sparkling wines as a conclusion. Christmas carols may also be sung. In the United Kingdom Christmas decorations are put up in shops and town centres from early November. Many towns and cities have a public event involving a local or regional celebrity to mark the switching on of Christmas lights. Decorations in people's homes are commonly put up from early December, traditionally including a Christmas tree, cards, and lights both inside and outside the home. 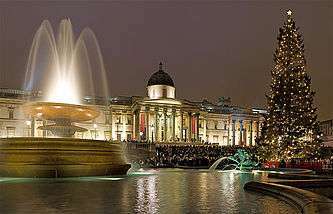 Every year, Norway donates a giant Christmas tree for the British to raise in Trafalgar Square as a thank you for helping during the Second World War. Christmas carolers at Trafalgar Square in London sing around the tree on various evenings up until Christmas Eve and Christmas decorations are traditionally left up until the evening of January 5 (the night before Epiphany); it is considered bad luck to have Christmas decorations up after this date. In practice, many Christmas traditions, such as the playing of Christmas music, largely stop after Christmas Day. Mince pies are traditionally sold during the festive season and are a popular food for Christmas. It is common in many UK households for children and adults to put up advent calendars in their homes, which may either contain chocolates or Christmas scenes behind their doors. A common feature of the Christmas season is the Nativity play which is practiced in most primary and some secondary schools across the UK. This practice is becoming less common, and Christmas pantomimes may be performed instead. Midnight Mass is also celebrated by Anglicans, Catholics, and other denominations, and services take place in nearly all Church of England parishes on Christmas Eve. On Christmas Eve, presents are supposedly delivered in stockings and under the Christmas tree by Father Christmas, who previously had been something like The Ghost of Christmas Present in Charles Dickens' A Christmas Carol (1843), but who has now become mainly conflated with Santa Claus. The two names are now used interchangeably and are equally known to British people, though some distinctive features still remain. Many families tell their children stories about Father Christmas and his reindeer. One tradition is to put out a plate of carrots for the reindeer, and mince pies and sherry for Father Christmas to help him on his way. The majority of families open their presents on the morning of Christmas Day, the Royal family being a notable exception, as they open their gifts on Christmas Eve, following German tradition introduced by the Hanoverians. Queen Victoria as a child made note of it in her diary for Christmas Eve 1832; the delighted 13-year-old princess wrote, "After dinner ... we then went into the drawing-room near the dining-room ... There were two large round tables on which were placed two trees hung with lights and sugar ornaments. All the presents being placed round the trees..". Since the first commercial Christmas card was produced in London in 1843, cards are sent in the weeks leading up to Christmas, many of which contain the English festive greeting Merry Christmas. On Christmas Day, a public holiday in the United Kingdom, nearly the whole population has the day off to be with their family and friends, so they can gather round for a traditional Christmas dinner, traditionally comprising a turkey with cranberries, brussels sprouts, parsnips, and roast potatoes, quite like the Sunday roast, and followed by a Christmas pudding. During the meal, Christmas crackers, containing toys, jokes, and a paper hat are pulled. Attendance at a Christmas Day church service has become less popular in modern times, with fewer than 3 million now attending a Christmas Day Church of England service. Watching the Queen's Speech on TV is a tradition that can be important in some households on Christmas Day, typically averaging 7 million viewers on TV, though it is declining in popularity, and 2 million listeners via radio. The Celebration of Boxing Day, on the day after Christmas Day, is a tradition practiced in the UK. It is a bank holiday, and if it happens to fall on a weekend then a special Bank Holiday Monday will occur. Also, depending on the day of the week, it is often a day when football matches are played in the professional leagues and many people go to watch their team play. Other traditions include carol singing - many carols are sung by children on people's doorsteps and by professional choirs - and sending Christmas cards. In public, there are decorations and lights in most shops, especially in town centres, and even in Indian and Chinese restaurants. Churches and cathedrals across the country hold masses, with many people going to midnight mass or a service on Christmas morning. Even though church attendance has been falling over the decades some people who do not go to church often think it is still important to go at Christmas, so Church attendance increases. Most theatres have a tradition of putting on a Christmas pantomime for children. The pantomime stories are traditionally based on popular children's stories such as Little Red Riding Hood and Aladdin, rather than being directly concerned with Christmas as such, although there is sometimes a link. Television is widely watched: for many television channels, Christmas Day is the most important day of the year in terms of ratings. In England, telling ghost stories, local legends, and other strange, bizarre, and fantastic "winter stories" (as Charles Dickens - author of A Christmas Carol -termed them) is a centuries-old tradition, to which William Shakespeare contributed with The Winter's Tale (1623) but which was well known even before Shakespeare's time. (In contrast, the Ireland, Scotland, and the USA favor Halloween as a time for telling ghostly tales.) Colin Fleming details other contributors to this tradition in the Paris Review. Christmas in Scotland was traditionally observed very quietly, because the Church of Scotland – a Presbyterian Church – for various reasons never placed much emphasis on the Christmas festival; although in Catholic areas people would attend Midnight Mass or early morning Mass before going to work. This tradition derives from the Church of Scotland's origins including St Columba's monastic tradition, under which every day is God's day and there is none more special than another. (Thus Good Friday is not an official public holiday in Scotland. ); the Kirk and the state being closely linked in Scotland during the Late Middle Ages and the Early Modern period. Christmas Day was commonly a normal working day in Scotland until the 1960s, and even into the 1970s in some areas. The New Year's Eve festivity, Hogmanay, was by far the largest celebration in Scotland. The gift-giving, public holidays and feasting associated with mid-winter were traditionally held between December 11 and January 6. However, since the 1980s, the fading of the Church's influence and the increased influences from the rest of the UK and elsewhere, Christmas and its related festivities are now nearly on a par with Hogmanay and "Ne'erday". 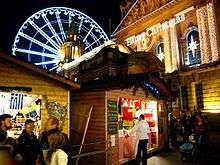 The capital city of Edinburgh now has a traditional German Christmas market from late November until Christmas Eve and on the first Sunday in Advent a nativity scene is blessed by the Cardinal Archbishop in the main square. On Christmas Day, people sometimes make big bonfires and dance around them to the playing of bagpipes. Bannock cakes made of oatmeal are traditionally eaten at Christmas. Christmas in Ireland is the largest celebration on the calendar in Ireland and lasts from December 24 to January 6, although many view December 8 as being the start of the season; and schools used to close on this day, making it a traditional Christmas shopping time, this is no longer compulsory and many stay open. Almost the entire workforce is finished by lunchtime on Christmas Eve, or often a few days beforehand. Christmas Day and St. Stephen's Day are public holidays, and many people do not return to work until after New Year's Day. Irish people spend more and more money each year on celebrating Christmas. In 2006, the total amount spent in Ireland to celebrate Christmas was €16 billion, which averages at approximately €4,000 for every single person in the country. It is extremely popular on Christmas Eve to go for "the Christmas drink" in the local pub, where regular punters are usually offered a Christmas drink. Many neighbours and friends attend each other's houses for Christmas drinks and parties on the days leading up to and after Christmas Day. Although religious devotion in Ireland today is considerably less than it used to be, there are huge attendances at religious services for Christmas Day, with Midnight Mass a popular choice. Most families arrange for their deceased relatives to be prayed for at these Masses as it is a time of remembering the dead in Ireland. It is traditional to decorate graves at Christmas with a wreath made of holly and ivy. Even in the most undevout of homes in Ireland the traditional crib takes centre stage along with the Christmas tree as part of the family's decorations. Some people light candles to signify symbolic hospitality for Mary and Joseph. Therefore, it is usual to see a white candle, or candle set, placed in several windows around people's homes. The candle was a way of saying there was room for Jesus's parents in these homes even if there was none in Bethlehem. It is traditional to leave a mince pie and a bottle or a glass of Guinness for Santa Claus along with a carrot for Rudolph on Christmas Eve. Santa Claus, often known in Ireland simply as Santy or Daidí na Nollag in Irish, brings presents to children in Ireland, which are opened on Christmas morning. Family and friends also give each other gifts at Christmas. The traditional Christmas dinner consists of turkey or goose and ham with a selection of vegetables and a variety of potatoes, as potatoes still act as a staple food in Ireland despite the popularisation of staples such as rice and pasta. Dessert is a very rich selection of Christmas pudding, Christmas cake, and mince pies with equally rich sauces such as brandy butter. 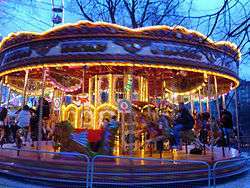 Christmas celebrations in Ireland finish with the celebration of Little Christmas also known as Oíche Nollaig na mBan in Irish on January 6. This festival, which coincides with Epiphany, is also known as Women's Christmas in Cork & Kerry. Christmas traditions in the Netherlands are almost the same as the ones in Dutch speaking parts of Belgium (Flanders). The Dutch recognize two days of Christmas as public holidays in the Netherlands, calling December 25 Eerste Kerstdag ("first Christmas day") and December 26 Tweede Kerstdag ("second Christmas day"). In families, it is customary to spend these days with either side of the family. In Catholic parts of the country, it used to be common to attend Christmas Eve midnight mass; this custom is upheld, but mostly by the elder generation and by fewer people every year. Christmas Eve is these days a rather normal evening without any special gatherings or meals. On Christmas Day, throughout both Flanders and the Netherlands elaborated meals are prepared by the host or together as a family. Also meals of which every participant / guest is preparing one dish are very common. The week before Christmas is important to the retail trade, because this is the biggest sales week in the country. Christmas songs are heard everywhere. The cities of Amsterdam, Rotterdam, The Hague and Eindhoven are the busiest cities in terms of entertainment on Christmas Day. Many people do not exchange gifts on Christmas, since this is already done during a separate holliday (Sinterklaas) a few weeks before Christmas. In Twente people will blow the mid-winter horns around Christmas. The Christmas season wraps up after the new year with Epiphany, or "Driekoningen". On January 6 children especially in the north of the Netherlands dress up as the Three Wise Men and travel in groups of three carrying lanterns, re-enacting the Epiphany and singing traditional songs for their hosts. In return they are rewarded with cakes and sweets. This practice is less common south of the great rivers. In the south and east of the Netherlands it is common practice to burn the Christmas trees of the community on a big pile on January 6 to celebrate the end of Christmas and the start of the new year. The Christmas Belles performing at Melbourne Crown atrium, every day on the hour between 3pm through to 6pm. It is a well choreographed 15-minute routine that uses the stairs quite effectively as part of the performance. In Australia, as with all of the Southern Hemisphere, Christmas occurs during the height of the summer season. Christmas Day and Boxing Day (December 25–26) are recognized as national public holidays in Australia, and workers are therefore entitled to a day off with pay. The Australian traditions and decorations are quite similar to those of the United Kingdom and North America, and similar wintry iconography is commonplace. This means a red fur-coated Santa Claus riding a sleigh, carols such as Jingle Bells, and various snow-covered Christmas scenes on Christmas cards and decorations appear in the middle of summer. As novelties, some Australian songwriters and authors have occasionally depicted Santa in "Australian"-style clothing including an Akubra hat, with warm-weather clothing and thongs, and riding in a ute pulled by kangaroos, (e.g. Six White Boomers by Rolf Harris) but these depictions have not replaced mainstream iconography. The December-flowering pōhutukawa (Metrosideros excelsa) is an often-used Christmas symbol in New Zealand. Christmas Day and Boxing Day are both statutory holidays in New Zealand. While Boxing Day is a standard statutory holiday, Christmas Day is one of the three-and-a-half days of the year where all but the most essential businesses and services must close. Many of New Zealand's Christmas traditions are similar to those of Australia in that they are a mix of United Kingdom and North American traditions conducted in summer. New Zealand celebrates Christmas with mainly traditional northern hemisphere winter imagery, mixed with local imagery. The Pōhutukawa (Metrosideros excelsa), which produces large crimson flowers in December, is an often used symbol for Christmas in New Zealand, and subsequently the pōhutukawa has become known as the New Zealand Christmas tree. ↑ "An Ethiopian Christmas". thestar.com. ↑ "Leddet (Ethiopian Christmas) - Stone Age Ethiopia Tours - Ethiopia Travel - Holiday in Ethiopia - Tour Package to Ethiopia". ↑ Afokansi, "Visits from not relations and friends"
1 2 3 4 5 Afokansi, "Abundance of food and drinks"
1 2 3 Afokansi, "Financial donations"
↑ "Public holidays". Government Communication and Information Service. Archived from the original on November 1, 2008. Retrieved December 26, 2012. ↑ "Christmas Day (Public Holiday)". Cape Town Magazine. Retrieved December 26, 2012. 1 2 "Christmas in South Africa". Retrieved September 25, 2014. 1 2 "How Christmas Started in China – LoveToKnow Christmas". Christmas.lovetoknow.com. October 27, 2009. Retrieved December 4, 2009. ↑ "Christmas in China". Retrieved September 25, 2014. ↑ "Hong Kong: Christmas". Hkfastfacts.com. March 6, 2011. Retrieved December 22, 2011. ↑ "Christmas in Hong Kong". 12hk.com. November 25, 2011. Retrieved December 22, 2011. ↑ "Christmas in Hong Kong: Around the World at Santa's Net". Santas.net. Retrieved December 22, 2011. ↑ Whipp, Lindsay (December 19, 2010). "All Japan wants for Christmas is Kentucky Fried Chicken". Japan Today. Retrieved July 23, 2012. ↑ "Christmas in India". TheHolidaySpot.com. Retrieved December 4, 2009. ↑ "Census of India – India at a Glance: Religious Compositions". Censusindia.gov.in. Retrieved December 4, 2009. ↑ "Indian Christianity". Retrieved September 25, 2014. ↑ "Christmas in India". Retrieved September 25, 2014. ↑ "Badaa Din, Indian Christmas movie". gomolo.com. Retrieved September 25, 2014. ↑ "Badaa Din". Public Radio International. Retrieved September 25, 2014. ↑ "Sweet Memories of Christmas from the heart of a Hindu who loves the joyful spirit of Christmas.". Merry-Christmas-Guide.com. Retrieved February 22, 2014. 1 2 "Christmas in Pakistan". Retrieved September 25, 2014. ↑ (Indonesian) Sensus Penduduk 2010:Penduduk Indonesia Menurut Wilayah dan Agama yang Dianut Badan Pusat Statistik. Accessed December 15, 2014. ↑ Christmas celebration, the Indonesian way, ID Nugroho & Anissa S. Febrina, The Jakarta Post, Jakarta. December 30, 2009. Diakses pada December 15, 2014. ↑ Christmas in Indonesia, whychristmas.com. Diakses pada December 15, 2014. ↑ "Rev Lim: Excluding carols with Jesus' name is scandalous". Malaysiakini.com. Retrieved December 4, 2009. ↑ "Christmas in the Philippines". Retrieved September 25, 2014. 1 2 3 "Christmas in the Philippines". Archived from the original on December 28, 2007. Retrieved September 25, 2014. ↑ "Christmas in Singapore". YourSingapore.com. November 11, 2011. Retrieved December 22, 2011. 1 2 3 4 Religion Aside, Christmas Gains Popularity in Communist Vietnam. December 21, 2014. Voice of America. Retrieved January 3, 2014. ↑ Margo Kirtikar (2011). Once Upon a Time in Baghdad. ↑ Encyclopedia Iranica (2012). "FESTIVALS ix.Assyrian". ↑ "Lebanon Public Holidays | AME Info Country Guide | AMEinfo.com". web.archive.org. Retrieved February 22, 2014. ↑ "Holiday Traditions | Lebanon". Museum of Science and Industry (Chicago). Retrieved December 14, 2013. ↑ "Mummers fest just part of rocking Yuletide". The Chronicle Herald. Retrieved September 25, 2014. ↑ "Mummering in Nova Scotia". LIFE AS A HUMAN. Retrieved September 25, 2014. ↑ Kenyon Wallace (December 22, 2010). "Santa Claus a Canadian, Immigration Minister Confirms". National Post. Retrieved September 25, 2014. ↑ "Canada Post's Santa Mail Expecting 20 Millionth Letter Soon". The Huffington Post. December 3, 2011. Retrieved September 25, 2014. ↑ "Special Events Office - Festivals and Events - Living In Toronto". City of Toronto. November 30, 2013. Retrieved December 14, 2013. ↑ "Bright Nights Christmas Train in Stanley Park". City of Vancouver. Retrieved December 14, 2013. ↑ "Christmas in Mexico". Santas.net. Australian Media Pty Ltd. Retrieved November 19, 2013. 1 2 "Christmas in the U.S.A.". Retrieved September 25, 2014. ↑ Hart Dowd. "Christmas Traditions and Holiday Cookies". allhomemadecookies.com. Retrieved December 14, 2013. ↑ "A very furry Christmas". Contracostatimes.com. Retrieved December 22, 2011. ↑ Lynne Olver. "The Food Timeline: Christmas food history". FoodTimeline.org. Retrieved December 14, 2013. ↑ "Christmas Carols - Christmas Time Is Here (Charlie Brown)". YouTube. December 25, 2008. Retrieved December 22, 2011. ↑ Notte, Jason (November 9, 2011). "Why All-Christmas Radio Keeps Coming Early". TheStreet.com. Retrieved November 21, 2011. ↑ "Christmas Festivities, Guatemala - Picture -". MSN Encarta. Archived from the original on October 31, 2009. 1 2 3 4 Gulevich, Tanya (2000). 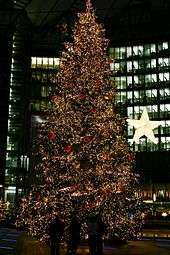 Encyclopedia of Christmas : nearly 200 alphabetically arranged entries covering all aspects of Christmas, including folk customs, religious observances, history, legends, symbols, and related days from Europe, America, and around the world. Detroit: Omnigraphics. ISBN 0780803876. ↑ "Colombia Aprende - A jugar aguinaldos". Retrieved September 25, 2014. ↑ "Cuba ends its 30-year ban on Christmas". The Independent. ↑ "Hungarian Heritage Museum". Retrieved September 18, 2007. ↑ "Christmas Season in Austria". austria.info. Retrieved September 25, 2014. ↑ "Christmas in Austria". Retrieved September 25, 2014. ↑ "Deutsche Botschaft Bern - Startseite". ↑ "German Christmas Vocabulary". German.about.com. June 22, 2010. Retrieved December 22, 2011. ↑ "Finis über das Werk "Erna, der Baum nadelt"". ZEIT ONLINE. December 19, 2013. ↑ Ball, Ann (2003). Encyclopedia of Catholic Devotions and Practices. Our Sunday Visitor Publishing. pp. 271–. ISBN 9780879739102. Retrieved November 20, 2015. ↑ "St. Nicholas Around the World: Hungary". Retrieved December 2, 2013. ↑ "Christmas traditions in Poland". Thehistoryofchristmas.com. Retrieved December 14, 2013. 1 2 "Boże Narodzenie i polskie tradycje,". Archived from the original on January 7, 2008. Retrieved September 25, 2014. ↑ "Christmas in Poland". Retrieved December 25, 2010. ↑ Rev. Jacek Kędzierski. "Pasterka przed północą... (Pasterka before midnight)". Przewodnik Katolicki 02/2009 (Catholic Guide) (in Polish). Drukarnia i Księgarnia św. Wojciecha. Retrieved December 19, 2012. ↑ "Christmas in Armenia". Retrieved September 25, 2014. ↑ "Nativity and Theophany of Our Lord "Overview"". www.armenianchurch-ed.net. Armenian Church. Retrieved November 6, 2014. ↑ "Traditions in Denmark". Retrieved September 25, 2014. ↑ "Christmas in Denmark". Retrieved September 25, 2014. 1 2 "Christmas in Finland". Retrieved September 25, 2014. ↑ "Christmas in Finland". Retrieved September 25, 2014. 1 2 3 "Christmas in Iceland". Retrieved September 25, 2014. 1 2 3 "Christmas in Norway". Retrieved September 25, 2014. ↑ TVparty. "Christmas in Norway fairytale". Retrieved September 25, 2014. 1 2 "Christmas in Sweden". Retrieved September 25, 2014. ↑ "Traditions in Sweden". Retrieved September 25, 2014. ↑ "From All of Us to All of You". IMDb. Retrieved September 25, 2014. 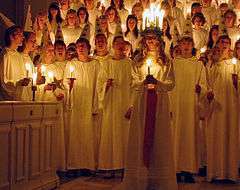 ↑ "With food, drink and candles, Sweden embraces Christmas". Retrieved September 25, 2014. 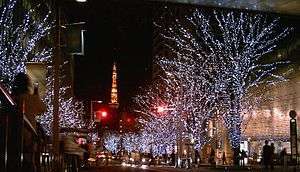 ↑ "How is Christmas Celebrated Around the World". CardStore.com. Retrieved November 19, 2013. ↑ "Bulgarian Christmas". Retrieved September 25, 2014. 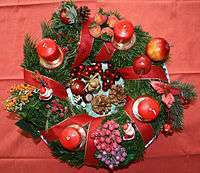 ↑ "Bulgaria's Christmas Traditions". Aboutcom. ↑ "Christmas in bulgaria". Indobase. ↑ "Christmas in Italy". Retrieved September 25, 2014. ↑ "Internet Archive Wayback Machine". Web.archive.org. October 27, 2009. Archived from the original on October 27, 2009. Retrieved December 22, 2011. 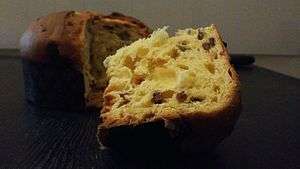 ↑ "History of Christmas Traditions - Italy". Buzzle.com. Retrieved December 22, 2011. ↑ "Caggionetti, Calgionetti, Caggiunitt at Christmas Time". Life in Abruzzo. December 22, 2010. Retrieved December 18, 2014. ↑ "Food: Italian Christmas Eve Fish Dinner". Sicilian Culture. December 25, 2002. Retrieved December 22, 2011. 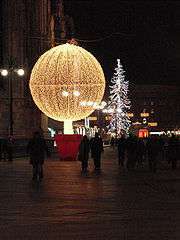 ↑ "Christmas traditions in Italy". Retrieved September 25, 2014. 1 2 "Traditional Bonfires of Veneto in winter solstice northeast italy winter solstice fires treviso traditions of veneto". Trevisoinfo.com. January 5, 2008. Retrieved December 22, 2011. ↑ Steves, Rick. "Rick Steves' Europe: Epiphany in Europe: Sweetness to share". RickSteves.com. Retrieved December 22, 2011. ↑ Italy. Google Books. January 1, 2004. ISBN 9781860111136. Retrieved December 22, 2011. ↑ "Hymns of the Feast". Feast of the Nativity of our Lord and Savior Jesus Christ. Greek Orthodox Archdiocese of America. 2009. ↑ "Christmas Traditions in Spain,". Retrieved September 25, 2014. ↑ "Réveillon". VirtualMuseum.ca. December 1, 1995. Retrieved December 22, 2011. ↑ "British Christmas: introduction, food, customs". Woodlands-Junior.Kent.sch.uk. ↑ "Christmas dinner". Retrieved September 25, 2014. ↑ "Project Britain Christmas". Retrieved September 25, 2014. ↑ The girlhood of Queen Victoria: a selection from Her Majesty's diaries. Longmans, Green & Co./University of Wisconsin. 1912. p. 61. ↑ Davis, Karen (2001). More than a meal: the turkey in history, myth, ritual, and reality. Lantern Books. ↑ "Christmas pudding: Icons of England". Retrieved September 25, 2014. ↑ Kimpton, Peter (2005). Tom Smith's Christmas crackers: an illustrated history. Tempus. ISBN 0-7524-3164-1. ↑ Owen, Peter (January 22, 2010). "Church of England statistics". Thinking Anglicans. Retrieved December 22, 2011. ↑ "BARB viewing figures". Barb.co.uk. December 11, 2011. Retrieved December 22, 2011. ↑ "Queen's speech flops with worst viewing figures". Scotsman.com. ↑ Peterson, Jeffrey (December 23, 2010). "Telling ghost stories is a lost tradition on Christmas Eve". Deseret News. ↑ Johnston, Derek (December 15, 2014). "Why ghosts haunt England at Christmas but steer clear of America". The Conversation. ↑ Fleming, Colin (December 19, 2014). "Ghosts on the Nog: The great English tradition of Christmas ghost stories". The Paris Review. 1 2 "Scottish Christmas". Retrieved September 25, 2014. ↑ Ross, Anthony (Autumn 1959). "Reformation and Repression". The Innes Review. Edinburgh: Edinburgh University Press. 10: 338–381. doi:10.3366/inr.1959.10.2.338. ISSN 0020-157X. Retrieved December 1, 2011. ↑ Christmas in Scotland: Christmas Around the World. World Book. 2001. p. 23. ISBN 978-0-7166-0860-8. ↑ Houston, Rab; Houston, Robert Allan (2008). Scotland: a very short introduction. Very short introductions. 197. Oxford University Press. p. 172. ISBN 978-0-19-923079-2. Retrieved December 4, 2011. ↑ Black, Rebecca. "News Ireland | Irish News Paper | Free News Stories Online from The Irish Independent Newspaper – Independent.ie". Unison.ie. Retrieved December 4, 2009. 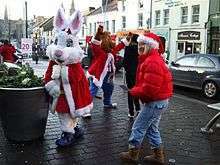 ↑ "Irish Christmas Traditions". ChristmasinDublin.com. Retrieved December 21, 2009. ↑ "Christmas in Holland / The Netherlands". Retrieved September 25, 2014. ↑ "Melbourne Christmas city". Mornington Peninsula Kids. Retrieved September 25, 2014. ↑ "Christmas events Melbourne". Retrieved September 25, 2014. ↑ "Pohutukawa trees". Ministry of Culture and Heritage (New Zealand). Retrieved September 6, 2012. Jennifer Eremeeva, "And so, is this Christmas?" Russia Now, December 15, 2010. Wikimedia Commons has media related to Christmas by country.